피도물의 표면에 건조 도막을 형성하기 위한 방법으로서, 300μm 이상의 건조 도막 두께 T를 설정하는 공정; A method for forming a dry film to the surface of the pidomul, the process for setting the dry film thickness of 300μm or more T; 바인더 수지 및 착색 안료를 적어도 함유하는 착색 도료로서, (a) 평균 입자경 10∼300μm, 평균 두께 2∼50μm, 어스펙트비 2∼100의 인편상 안료를 추가로 함유함, (b) 인편상 안료의 함유량이 도막 형성 성분 중 5∼45용량%, (c) 막 두께 T를 갖는 도막이 상기 표면을 은폐함, 및 (d) 막 두께 T의 도막과 막 두께 0.7T의 도막의 색차가 2.0 이상을 만족시키는 착색 도료를 조제 또는 준비하는 공정; As colored coating material containing a binder resin and a color pigment, at least, (a) an average particle size 10~300μm, should further contain a scaly pigment having an average thickness of 2~50μm, aspect ratio 2~100, (b) scaly pigment the content of the film forming components to 5 to 45 capacity%, (c) should cover up the coating film surface has a thickness T, and (d) the film and the film thickness of the color difference of 0.7T with a film thickness of more than 2.0 T satisfying process for the preparation or the preparation of colored pigment; 상기 표면이 은폐될 때까지 착색 도료를 도공하는 공정; A step of coating a colored coating until the cover surface; 얻어진 도막을 건조시키는 공정을 포함하는 방법, 및 그것에 이용하는 도료가 제공된다. The method including the step of drying the coating film thus obtained, and the coating material used in it are provided. 본 발명은 막 두께 부족을 억제하면서 간편하게 후(厚)막인 건조 도막을 형성할 수 있는 도막 형성 방법, 및 그것에 이용하는 도료에 관한 것이다. The present invention relates to a film forming method, and a coating on it using a film capable of forming a dry film (厚) then easily while suppressing the film thickness insufficient. 피도물 표면에 원하는 특성을 부여하기 위해서, 해당 표면에 소정 성분을 포함하는 도료(도료 조성물)를 도공하고, 이것을 건조시켜 건조 도막을 형성하는 것은 잘 알려진 기술이다. It is a well known technique for to impart desired properties to the pidomul surface, coating a coating material (coating composition) containing the predetermined components on the surface, which was dried to form a dry film. 도막의 형성에 의해 원하는 특성을 부여하기 위해서는 건조 도막의 막 두께 관리가 중요하고, 형성된 건조 도막이 충분한 막 두께를 갖고 있지 않으면, 부여되어야 할 특성도 불충분해지기 쉽다. In order to impart the desired characteristics by the formation of a coating film do not have a dry coating film thickness sufficient film thickness control is important, and is formed of a dry film, it is also likely to be sufficient characteristics to be given. 등이 있다. And the like. 그러나, 상기 어느 방법에 있어서도, 특히 다음과 같은 경우에는 사실상 막 두께 관리는 곤란했다. However, also in the method which, in particular when the following fact has a thickness management has been difficult. 1) 예를 들면 선박 등과 같이, 도료가 도공되는 피도물 표면의 면적이 넓은 경우. 1), for example, such as vessels, if the area of ​​the surface on which the paint coating pidomul wide. 이 경우, 피도물 표면의 전체에 걸쳐서 웨트 게이지나 전자식 막 두께계 등을 이용하여 막 두께를 측정하는 것은 극히 번잡하고, 실제상 곤란하다. In this case, it is measuring the film thickness by using a full-gauge or electronic, such as wet film thickness meter over the surface of pidomul is extremely complicated and difficult to actual phase. 2) 도료가 도공되는 피도물 표면이, 도공이 용이하지 않은 표면을 포함하는 경우. 2) the surface on which the paint pidomul coating, if the coating comprises a surface that is not susceptible. 도료의 도공이 용이하지 않은 표면에서는 막 두께의 불균일이 생기기 쉬움에도 불구하고, 이러한 표면에 형성된 도막의 막 두께를 웨트 게이지나 전자식 막 두께계 등을 이용하여 측정하는 것은 왕왕 어렵고, 또한 번잡하다. Despite easy to occur is a coating unevenness of the that is not susceptible surface thickness of the coating, and it is difficult wangwang measuring using a film such as a wet-gauge or electromagnetic film thickness meter thickness of the coating film formed on this surface, it is also troublesome. 3) 1회 칠로 형성되는 도막의 목표로 하는 막 두께가 큰 경우. 3) If the thickness of the coating film, which aims to be formed once fills large. 1회 칠로 형성하려고 하는 도막이 후막일수록, 도공 도중의 도막 두께의 측정 빈도가 많아지기 쉬워, 막 두께 관리가 번잡해진다. The more the thick film coating is formed once trying to fill and, in the film thickness during the coating becomes easier measurement frequency is increased, the thickness control becomes complicated film. 한편, 「1회 칠」이란, 도료를 도공하여 건조 처리를 행할 때까지의 일련의 조작이 1회인 것을 말하고, 따라서 1회 칠로 형성되는 도막이란, 도료를 1회 또는 복수회 덧칠하여 도공한 후, 건조 처리를 1회 행하여 형성되는 도막을 말한다. On the other hand, "one hit" is, then by coating the coating material to say that a series of operation is one hoein to when performing a drying process, and thus once a coating film formed fill and is, coats by coating one or a plurality of times the paint refers to a coating film to be formed once subjected to a drying treatment. 상기와 같은 종래의 문제점을 해결하기 위한 방법으로서 일본 특허공개 평10-216621호 공보(특허문헌 1) 및 일본 특허공개 2002-066445호 공보(특허문헌 2)에는, 도막을 형성하기 위한 도료로서 「막 두께 판정 도료」라고 불리는, 도공 도중의 웨트 도막의 색차 변화를 도공 작업자가 육안으로 관찰하는 것에 의해 규정의 막 두께에 도달했는지 여부를 판정할 수 있는 도료를 이용하여 도막을 형성하는 것이 개시되어 있다. In a method for solving the conventional problems in Japanese Patent Publication No. 10-216621 discloses (Patent Document 1) and Japanese Patent Laid-Open Publication 2002-066445 JP-Patent Document 2 as described above, as the coating material for forming a coating film " is disclosed to form a film by the film is wet-coating a color difference a coating operator changes in the way the thickness determination called coating ", the coating using the coating material that can determine whether or not reach the thickness of the regulation by observation with the naked eye have. 특허문헌 1 및 2에 기재되는 막 두께 판정 도료는 모두 100μm 이상의 목표 건조 막 두께를 갖는 도막을 형성하기 위해서 이용되는 도료이며, 거기에 포함되는 착색 안료의 함유량을 조정하는 것에 의해, 색차에 관해서 다음과 같은 관계를 충족시키도록 조제된 도료이다. Patent determined film thickness described in the documents 1 and 2 coating is a coating material which is used to both form a coating film having a target dry film thickness of more than 100μm, by adjusting the content of the color pigment to be contained therein, with respect to the color difference, and then and the coating material is prepared so as to satisfy the same relations. 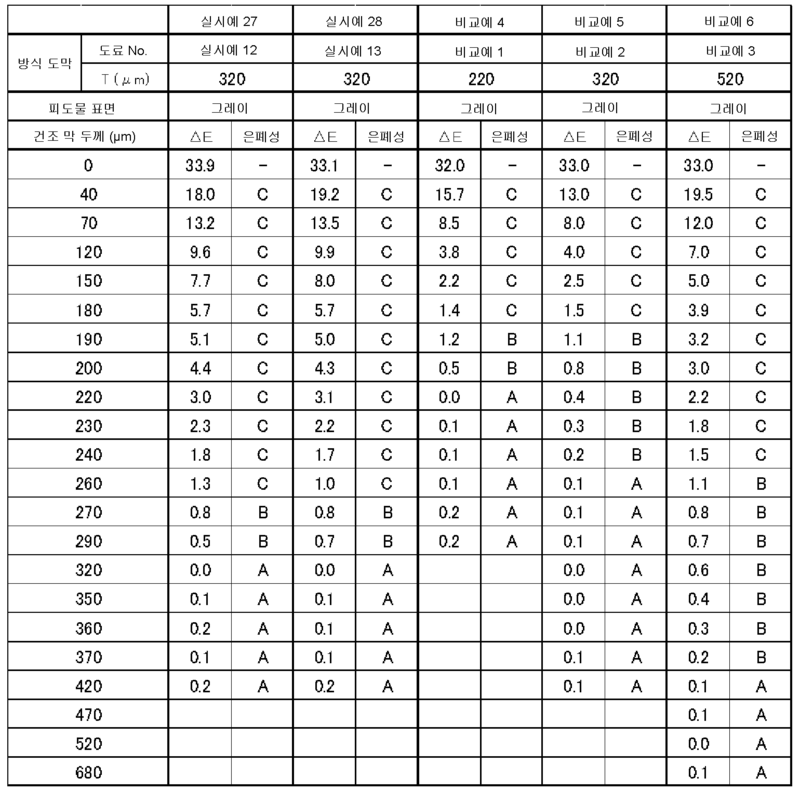 (c) 목표 건조 막 두께의 도막과 (목표 건조 막 두께+50)μm 초과의 건조 막 두께의 도막의 색차가 1 미만. (C) a target dry film thickness of the coated film and (a target dry film thickness + 50) than the color difference in the coating film in a dry film thickness of 1 μm is exceeded. 상기 중에서도 특히 (b)는 중요하고, 목표의 막 두께에 꽤 가까워져 있는 도막의 색상과 목표의 막 두께에 도달한 도막의 색상의 차이가 명확하지 않으면, 도공 작업자는, 도공 도중의 웨트 도막이, 건조 도막으로서 목표의 막 두께에 도달했는지, 또는 아직 막 두께 부족인지를 육안으로 판정하는 것이 곤란해져 버린다. The particularly (b) is important and, if the film quite closer differences in color of the coating film reaches a thickness of the color and the target of the coating film in the thickness of the target is not clear, a coating operator, the wet coating film, followed by drying during the coating that as the film reaches the thickness of the target, or discard it becomes difficult to visually determine whether the still insufficient thickness. 따라서, 목표의 막 두께에 꽤 가까워져 있는 도막과 목표의 막 두께에 도달한 도막의 색차가 클수록 막 두께 판정하기 쉽다고 말할 수 있지만, 1회 칠로 상당히 두꺼운 도막을 형성하는 경우, 당해 색차를 충분히 크게 하는 것이 어렵다는 문제가 새롭게 발각되었다. Therefore, speaking easy larger the color difference of the coating film reaches a thickness of the coating film with fairly closer to the film thickness of the target and the target to determine the film thickness, but, in the case of forming an extremely thick film once fills, to sufficiently increase the art color difference it was a difficult problem, discovered anew. 보다 구체적으로 설명하면, 1회 칠로 형성되는 도막의 목표 건조 막 두께가 250μm 정도까지이면(특허문헌 1의 실시예에 있어서의 목표 건조 막 두께는 125μm이고, 특허문헌 2의 실시예에 있어서의 목표 건조 막 두께는 최대 250μm이다), 이들 특허문헌에 기재된 조제 수법에 따라 상기 색차를 어느 정도 크게 하여, 원하는 막 두께를 갖는 도막을 형성함에 있어서 비교적 용이하게 막 두께 판정을 행하는 것이 가능했다. And more specifically, one-time back fills to a target dry thickness of the coated film 250μm degree to which the formation (125μm is the target dry film thickness according to the embodiment of Patent Document 1, the target according to the embodiment of Patent Document 2 the dry film thickness of up to 250μm), the larger the color difference to some extent in accordance with the preparation methods described in these patent documents, it was possible to perform the film thickness relatively easily determined in forming a coating film having a desired film thickness. 한편, 종래에 있어서도, 250μm를 초과하는 후막인 도막을 피도물에 형성하는 것은 행해지고 있었다. On the other hand, in the prior art, it was carried out the formation of a thick film the film exceeding 250μm in pidomul. 선박이나, 교량과 같은 해양 구조물, 플랜트와 같은 강 제 구조물의 표면에 형성되는 방식 도막(방청 도막)이 그 대표예이다. The anticorrosive coating film (anticorrosive coating film) formed on a marine structure, the steel surface of the structure, such as a plant, such as a ship or a bridge that is a typical example. 그러나, 종래에 있어서 이와 같은 후막인 도막은 1회 칠은 아니고, 복수회 칠(도공→건조의 일련의 공정을 복수회 실시하여 건조 도막을 덧칠하는 도공법)로 형성되는 것이 통상이었다. However, in a conventional thick film of this coating it was generally be formed as a one-time hit, rather than a plurality of times paint (coating method that coats the dry film by performing a plurality of times a series of steps of coating → drying). 그런데, 예를 들면 300μm 이상의 후막인 도막을 복수회 칠이 아니라, 1회 칠로 형성하는 도공법이 근래에 들어 채용되기에 이르자, 목표의 막 두께에 꽤 가까워져 있는 도막과 목표의 막 두께에 도달한 도막의 색차를 충분히 크게 하는 것이 어려워, 웨트 도막이 목표의 막 두께에 도달했는지, 또는 아직 막 두께 부족인지를 판정하는 것이 용이하지 않다는 문제를 초래하게 되었다. By the way, for example as a plurality of times to hit the thick film of the coating film more than 300μm, 1 times fills By the be employed included in the recent years, a coating method to form, reaches the coating film with fairly closer to the film thickness of the target and the target film thickness difficult to sufficiently increase the color difference in the coating film has reached a thickness of the wet coating film target, or was causing the problem is not easy to determine if the still insufficient thickness. 그래서 본 발명은, 1회 칠로 300μm 이상의 후막인 도막을 형성하는 경우이더라도, 막 두께 부족을 억제하면서 간편하게 건조 도막을 형성할 수 있는 도막 형성 방법, 및 그것에 이용하는 도료의 제공을 목적으로 한다. So the present invention, one fills even when forming a thick coating film is more than 300μm, and a coating film forming method which easily while suppressing the film thickness enough to form a dry film, and provides a coating material for the purpose of using it. 본 발명은 이하의 도막 형성 방법 및 착색 도료를 제공한다. The present invention provides a film forming method and a colored pigment or less. 를 추가로 만족시키는, 〔1〕에 기재된 방법. A method described in more , which satisfies a. 를 추가로 만족시키는, 〔1〕 또는 〔2〕에 기재된 방법. The method described in additional,  or  satisfying a. 〔4〕 상기 건조 도막 두께 T를 갖는 상기 착색 도료로 형성되는 도막은 은폐율이 0.90∼0.98인, 〔1〕∼〔3〕 중 어느 하나에 기재된 방법. The coating film formed from a colored coating having a dry film thickness T is a method according to any one of the hiding ratio is from 0.90 to 0.98 is,  to . 〔5〕 상기 착색 도료는 경화제를 추가로 함유하는, 〔1〕∼〔4〕 중 어느 하나에 기재된 방법. Method according to any one of the above colored coating is,  to , which further contains a curing agent. 〔6〕 상기 경화제는 가드너 색수가 18 이하인, 〔5〕에 기재된 방법. the method described in the curing agent is less than or equal to the number of Gardner color 18, . 〔7〕 상기 착색 안료의 함유량이, 도막 형성 성분 중, 0.01∼3용량%인, 〔1〕∼〔6〕 중 어느 하나에 기재된 방법. Method according to any one of the content of the coloring pigment, the coating film-forming component, 0.01 to 3% by volume of,  to . 〔8〕 상기 인편상 안료가 탈크, 마이카 및 글라스 플레이크로 이루어지는 군으로부터 선택되는 적어도 1종의 안료인, 〔1〕∼〔7〕 중 어느 하나에 기재된 방법. the method described in any one of the flaky pigment is talc, mica, and at least one kind of pigment selected from the group consisting of glass flake,  to . 〔9〕 상기 착색 안료가 이산화 타이타늄을 포함하는, 〔1〕∼〔8〕 중 어느 하나에 기재된 방법. Method according to any one of the color pigment is,  to , including titanium dioxide. 〔10〕 상기 피도물의 표면은 강제이거나 또는 상기 피도물이 갖는 하도(下塗)층의 표면인, 〔1〕∼〔9〕 중 어느 하나에 기재된 방법. the surface of the pidomul is forced or or method according to any of the surface of the undercoating layer (下 塗) having said pidomul,  to . 를 만족시키는 착색 도료. Colored pigment satisfying. 를 추가로 만족시키는, 〔11〕에 기재된 착색 도료. The colored pigment according to add,  that satisfies a. 를 추가로 만족시키는, 〔11〕 또는 〔12〕에 기재된 착색 도료. The colored pigment according to add,  or  that satisfies a. 〔14〕 상기 건조 도막 두께 T를 갖는 상기 착색 도료로 형성되는 도막은 은폐율이 0.90∼0.98인, 〔11〕∼〔13〕 중 어느 하나에 기재된 착색 도료. colored pigment according to any one of the coating film formed with the colored coating having a dry film thickness T is from 0.90 to 0.98 of the opaque rate,  - . 〔15〕 경화제를 추가로 함유하는, 〔11〕∼〔14〕 중 어느 하나에 기재된 착색 도료. colored pigment according to any one of  - , which further contains a curing agent. 〔16〕 상기 경화제는 가드너 색수가 18 이하인, 〔15〕에 기재된 착색 도료. The curing agent is color Gardner number of 18 or less, the colored coating material as described in . 〔17〕 상기 착색 안료의 함유량이, 도막 형성 성분 중, 0.01∼3용량%인, 〔11〕∼〔16〕 중 어느 하나에 기재된 착색 도료. the colored coating material as described in any of the content of the color pigment, of the coating film-forming component, 0.01 to 3% by volume of,  - . 〔18〕 상기 인편상 안료가 탈크, 마이카 및 글라스 플레이크로 이루어지는 군으로부터 선택되는 적어도 1종의 안료인, 〔11〕∼〔17〕 중 어느 하나에 기재된 착색 도료. The flaky pigment is talc, mica, and glass, at least one kind of pigment selected from the group consisting of flakes,  - colored pigment according to any one of . 〔19〕 상기 착색 안료가 이산화 타이타늄을 포함하는, 〔11〕∼〔18〕 중 어느 하나에 기재된 착색 도료. colored pigment according to any one of the color pigment is,  -  containing titanium dioxide. 본 발명에 의하면, 1회 칠로 300μm 이상의 후막인 도막을 형성하는 경우이더라도, 막 두께 부족을 억제하면서 간편하게 건조 도막을 형성할 수 있다. According to the invention, one fills even when forming a thick coating film is more than 300μm, it is possible to form a dry film easily while suppressing the film thickness insufficient. 도 1은 표 3∼5에 나타내는 건조 막 두께(μm)와 ΔE의 관계를 그래프화한 도면이다(실시예 14와 비교예 5). 1 is a view graphed the relationship between the dry film thickness (μm) and ΔE shown in Table 3-5 (Comparative Example 5 and Example 14). 도 2는 표 3∼5에 나타내는 건조 막 두께(μm)와 ΔE의 관계를 그래프화한 도면이다(실시예 23과 비교예 6). 2 is a view of the relationship graph dry film thickness (μm) screen and ΔE shown in Table 3-5 (Example 23 and Comparative Example 6). 도 3은 표 3∼5에 나타내는 건조 막 두께(μm)와 ΔE의 관계를 그래프화한 도면이다(실시예 14∼16). 3 is a view graph of the relationship between the dry film thickness (μm) and ΔE shown in Tables 3 to 5 (Examples 14 to 16). 도 4는 표 3∼5에 나타내는 건조 막 두께(μm)와 ΔE의 관계를 그래프화한 도면이다(실시예 17∼19). 4 is a view graph the relationship between the dry film thickness (μm) and ΔE screen shown in Tables 3 to 5 (Examples 17-19). 도 5는 표 3∼5에 나타내는 건조 막 두께(μm)와 ΔE의 관계를 그래프화한 도면이다(실시예 20∼22). 5 is a view graph the relationship between the dry film thickness (μm) and ΔE screen shown in Tables 3 to 5 (Examples 20-22). 도 6은 표 3∼5에 나타내는 건조 막 두께(μm)와 ΔE의 관계를 그래프화한 도면이다(실시예 24). 6 is a view graph the relationship between the dry film thickness (μm) screen and ΔE shown in Table 3-5 (Example 24). 도 7은 표 3∼5에 나타내는 건조 막 두께(μm)와 ΔE의 관계를 그래프화한 도면이다(실시예 25∼28). 7 is a view graph of the relationship between the dry film thickness (μm) and ΔE shown in Tables 3 to 5 (Examples 25-28). 도 8은 표 3∼5에 나타내는 건조 막 두께(μm)와 ΔE의 관계를 그래프화한 도면이다(비교예 4). 8 is a diagram graphing the relationship between the dry film thickness (μm) and ΔE shown in Table 3-5 (Comparative Example 4). 이하, 본 발명에 대하여 상세하게 설명한다. Hereinafter, a detailed description will be given of the present invention. 본 발명에 따른 도막 형성 방법에서는, 건조 도막을 형성하기 위한 도료로서 소정의 착색 도료(착색 도료 조성물)가 이용된다. In the film forming process according to the invention, it is a coating material for forming a dry film of a predetermined colored pigment (colored coating composition) is used. 이 착색 도료는, 도장 중의 도막(웨트 도막)의 색상을 육안으로 관찰하는 것에 의해 소정의 막 두께에 도달했는지를 판정할 수 있는 「막 두께 판정 기능」을 갖는 도료이다. The colored coating is a coating having a "thickness determining function" which can be determined whether the predetermined thickness of the film reaches by observing the color of the coating film (wet film) of the coating with the naked eye. 이하에서는 우선, 본 발명에 따른 착색 도료에 대하여 상세하게 설명한다. First, in the following, detailed description will be given of the colored coating in accordance with the present invention. 본 발명에 따른 착색 도료는 바인더 수지 및 착색 안료를 적어도 함유하는 것이다. Colored pigment according to the invention containing at least a binder resin and a coloring pigment. 착색 도료는 각종 용도에 사용되는 도료일 수 있고, 소정의 막 두께로 건조 도막을 형성할 것이 요구되는 모든 용도의 도료일 수 있는데, 하나의 대표예는 방식 도료(방청 도료)이다. Colored coating may be a coating material which is used in various applications, may be a coating material for all applications where required to form a dry film with a predetermined thickness, a representative example is an anticorrosive coating (anticorrosive). 이하에서는, 방식 도료로서의 착색 도료가 함유할 수 있는 배합 성분에 대하여 설명한다. Hereinafter, description will be made with the blend components which may contain a colored pigment as an anticorrosive coating. 바인더 수지는, 에폭시 수지; The binder resin is an epoxy resin; 알키드 수지; Alkyd resins; (메트)아크릴계 수지; (Meth) acrylic resin; 유레테인 수지; Urethane resins; 염화 바이닐계 수지, 아세트산 바이닐계 수지 등의 바이닐계 수지; Vinyl-based resins such as vinyl chloride resin, vinyl acetate-based resin; 염소화 올레핀 수지, 염화 고무 또는 이들의 변성물일 수 있다. Chlorinated olefin resin, chlorinated rubber, or may be water-modified thereof. 바인더 수지는 1종의 수지로 이루어져 있어도 되고, 2종 이상의 수지의 혼합물이어도 된다. The binder resin may be composed of one kind of resin may be a mixture of two or more resins. 또한, 바인더 수지는 고형이어도 되고, 액상이어도 된다. In addition, the binder resin may be a solid, or may be liquid. 그 중에서도, 에폭시 수지 또는 그의 변성물이 적합하게 이용된다. Of these, epoxy resins or their modified products are preferably used. 에폭시 수지의 구체예는, 비스페놀 A형 에폭시 수지, 비스페놀 F형 에폭시 수지, 비스페놀 S형 에폭시 수지, 비스페놀 B형 에폭시 수지, 비스페놀 AD형 에폭시 수지와 같은 비스페놀형 에폭시 수지; Specific examples of the epoxy resins, bisphenol type epoxy resins such as bisphenol A type epoxy resins, bisphenol F type epoxy resin, bisphenol S type epoxy resins, bisphenol B-type epoxy resins, bisphenol AD ​​type epoxy resin; 페놀 노볼락형 에폭시 수지, 크레졸 노볼락형 에폭시 수지와 같은 노볼락형 에폭시 수지; Novolak epoxy resins such as phenol novolac epoxy resins, cresol novolak epoxy resins; 바이페닐형 에폭시 수지, 나프탈렌형 에폭시 수지, 반응성 희석제 에폭시 에스터형 에폭시 수지, 글리시딜 아민형 에폭시 수지를 포함한다. And a biphenyl-type epoxy resins, naphthalene type epoxy resin, reactive diluent, epoxy ester type epoxy resin, glycidyl amine type epoxy resin. 또한, 에폭시 수지는 1종만을 단독으로 이용해도 되고, 2종 이상을 병용해도 된다. Further, the epoxy resin is to be used one species alone, or may be a combination of two or more. 변성 에폭시 수지의 구체예는, 카복실산 변성 에폭시 수지, 아민 변성 에폭시 수지, 인산 변성 에폭시 수지, 석유 수지 변성 에폭시 수지, 고무 변성 에폭시 수지를 포함한다. Specific examples of the modified epoxy resin, carboxylic acid modified to contain an epoxy resin, amine-modified epoxy resin, a phosphoric acid-modified epoxy resin, petroleum resin-modified epoxy resin, rubber-modified epoxy resin. 변성 에폭시 수지는 1종만을 단독으로 이용해도 되고, 2종 이상을 병용해도 된다. Modified epoxy resin is also possible to use the one species alone, or may be a combination of two or more. 석유 수지 변성 에폭시 수지는, 에폭시 수지와 석유 수지를 상온에서 혼합하는 방법, 또는 그들의 혼합물을 가열하에 반응시켜, 에폭시기의 일부를 개환시키는 방법에 의해 얻을 수 있다. Petroleum resin-modified epoxy resins, by reacting under heating a method of mixing at room temperature, the epoxy resin and petroleum resin, or mixtures thereof, can be obtained by a method of ring-opening a part of epoxy group. 석유 수지 변성 에폭시 수지 중의 석유 수지의 함유량은, 에폭시 수지 100질량부에 대하여, 통상 10∼500질량부이다. The content of the petroleum resin in the petroleum resin-modified epoxy resin, is usually 10 to 500 parts by mass based on 100 parts by weight of epoxy resin. 석유 수지로서는, 석유 나프타 분해로 부생되는 중질유 중의 스타이렌 유도체, 인덴, 바이닐 톨루엔 등의 C9 유분(留分)을 중합시킨 방향족계 석유 수지; Aromatic petroleum resin by polymerizing a C9 fraction (留 分) As the petroleum resin, styrene derivatives, indene, vinyl toluene and the like in the heavy oil which is by-produced in petroleum naphtha cracking; 1,3-펜타다이엔, 아이소프렌 등의 C5 유분을 중합시킨 지방족계 석유 수지; Penta-1,3-diene, ah aliphatic petroleum resins having polymerizing C5 fractions, such as isoprene; 상기 C9 유분과 C5 유분을 공중합시킨 공중합계 석유 수지; Aerial total petroleum resin obtained by copolymerizing the C9 fraction and the C5 fraction; 사이클로펜타다이엔, 1,3-펜타다이엔 등의 C5 유분의 공액 다이엔이 일부 환화 중합된 지방족계 석유 수지; Cyclopentadiene, 1,3-pentadiene, etc. The conjugated diene of the C5 fraction of the aliphatic diene-based petroleum resin polymerization, some cyclization; 상기 방향족계 석유 수지를 수소 첨가한 수지; Resins by hydrogenating the aromatic petroleum resins; 다이사이클로펜타다이엔을 중합시킨 지환족계 석유 수지 등을 들 수 있다. Die-cyclopenta may include dienes having alicyclic hydrocarbon resin such as the polymerization. 또한 바이닐계 수지로서는, 염화 바이닐, 바이닐 아이소뷰틸 에터, 아세트산 바이닐, 바이닐 프로피오네이트, 바이닐 피발레이트, 프로피온산 바이닐 등의 바이닐계 단량체를 중합시켜 얻어지는 수지이면 특별히 한정되지 않지만, 단량체 성분 중 염화 바이닐을 50질량% 이상 포함하는 염화 바이닐계 수지가 바람직하다. In addition, as the vinyl-based resin, a vinyl chloride, vinyl isobutyl ether, vinyl acetate, vinyl propionate, vinyl pivalate, propionate, is a resin obtained by polymerizing a vinyl monomer such as vinyl of not particularly limited, and monomer components vinyl chloride the vinyl chloride-based resin containing 50 mass% or more is preferred. 그 중에서도, 도장 작업성 등의 관점에서, 염화 바이닐/바이닐 아이소뷰틸 에터 공중합체가 바람직하다. Among these, from the viewpoint of coating workability, a vinyl chloride / vinyl isobutyl ether copolymer. 당해 공중합체의 시판품으로서는, 「Laloflex MP-45」(염화 바이닐/바이닐 아이소뷰틸 에터 공중합체(모노머 비율(질량비): 약 75/25), BASF사제) 등이 있다. Examples of commercially available products of such copolymer, "Laloflex MP-45": and the like (vinyl chloride / vinyl isobutyl ether copolymer (monomer ratio (by weight) of about 75/25), BASF Corp.). 도막 형성 성분 100질량% 중의 바인더 수지의 함유량은 통상 10∼80질량%이고, 바람직하게는 20∼70질량%(예를 들면 20∼60질량%)이다. Content of 100% by weight of the film forming component and the binder resin is usually from 10 to 80% by weight, preferably 20 to 70 mass% (for example 20 to 60% by weight). 도막 형성 성분이란, 착색 도료에 포함되는 용제 이외의 전체 성분을 의미한다. Film-forming component refers to a component of the total solvent contained in the non-colored coating. 10∼60질량% 포함되는 것이 바람직하다. 10 to 60 mass% is preferably contained. 10질량% 미만이면, 얻어지는 도막의 방식성이 뒤떨어지는 경우가 있고, 80질량%를 초과하면, 도막이 지나치게 단단해져 내크랙성이 저하되거나, 피도물의 표면에 대한 밀착성이 저하되거나 하는 경우가 있다. If it exceeds 10% by mass it is less than, and sometimes the corrosion resistance of the coating film obtained inferior, and 80% by mass, the coating film is too hardened crack resistance may be degraded, or, in some cases, or the adhesion to the surface of pidomul reduced. 또한 상기 바인더 수지, 특히 에폭시 수지 및/또는 변성 에폭시 수지와 함께, 예를 들면, 버사트산 글리시딜 에스터, 페닐 글리시딜 에터, 알킬 글리시딜 에터(예를 들면 n-뷰틸 글리시딜 에터), 스타이렌 옥사이드, 알릴 글리시딜 에터, 글리세린형 에폭시 수지, 트라이페닐 포스파이트, 다이사이클로펜타다이엔 다이에폭사이드, 바이닐 사이클로헥센 다이에폭사이드, 알킬 페놀 글리시딜 에터 등의 에폭시계 반응성 희석제를 병용해도 된다. In addition, with the binder resin, in particular epoxy resin and / or modified epoxy resin, for example, Bertha acid glycidyl ester, phenyl glycidyl ether, alkyl glycidyl ether (for example n- butyl glycidyl ether ), styrene oxide, allyl glycidyl ether, epoxy, such as glycerin type epoxy resins, triphenyl phosphite, di-cyclopentadienyl die polyepoxide to, vinyl cyclohexene die on polyepoxide, an alkylphenol glycidyl ether-based It may be used in combination with a reactive diluent. 착색 도료에 함유시키는 착색 안료로서는, 종래 공지의 각종 착색 안료를 이용할 수 있고, 착색 안료의 선택에 의해 각종 색상의 착색 도료를 실현할 수 있다. As the coloring pigment contained in the colored coating, can be used the conventional various known coloring pigments, it is possible to achieve a colored pigment of various colors by selection of the color pigment. 착색 도료에 첨가하는 착색 안료의 종류(착색 방식 도료의 색상)는 피도물의 표면(피도공면)의 색에 따라서 선택할 수 있고, 건조 도막 두께 T를 갖는 착색 도료로 형성되는 도막과, 피도물의 표면의 색차 ΔE3이 20 이상이 되도록 착색 안료의 종류 또는 조합을 선택하는 것이 바람직하다. Kind of coloring pigment added to the colored pigment (color of the colored anticorrosive coating) may be selected according to the color of the surface of the pidomul (to-be-coated surface), the surface of the film and, pidomul formed from a colored coating having a dry film thickness T the color difference ΔE3 is preferred to select the kind or the combination of the colored pigment is at least 20. 한편, 건조 도막 두께 T를 갖는 착색 도료로 형성되는 도막의 색상은, 예를 들면 색 분리가 생기지 않는 통상의 용제형 도료이면, 착색 도료 그 자체의 색상과 실질적으로 동일하다. On the other hand, the color of the coating film formed from a colored coating having a dry film thickness T, for example, if the conventional solvent-based coating material is the color separation does not occur, the colored coating material is substantially the same as that of its own color and. 착색 안료의 구체예는 특별히 제한되지 않고, 예를 들면 카본 블랙, 이산화 타이타늄, 산화 지르코늄, 염기성 황산 납, 산화 주석, 연백, 흑연, 황화 아연, 산화 아연, 산화 크로뮴, 황색 니켈 타이타늄, 황색 크로뮴 타이타늄, 황색 산화 철, 적색 산화 철, 흑색 산화 철, 크로뮴 옐로, 프탈로사이아닌 블루, 프탈로사이아닌 그린, 울트라마린 블루, 퀴나크리돈류, 아조계 적·황색 안료 등을 이용할 수 있다. Specific examples of the coloring pigment is not particularly limited, for example, carbon black, titanium dioxide, zirconium oxide, basic lead sulfate, tin oxide, white lead, graphite, zinc sulfide, zinc oxide, chromium, yellow nickel titanium, yellow chromium titanium , and the yellow iron oxide, red iron oxide, black iron oxide, chromium yellow, green print, not between non-blue, phthalocyanine between phthaloyl, ultramarine blue, quinacridones, such as red, azo-based yellow pigment can be used. 착색 안료는 1종만을 단독으로 이용해도 되고, 2종 이상을 병용해도 된다. Colored pigment is also possible to use the one species alone, or may be a combination of two or more. 그 중에서도, 착색력이 높기 때문에, 카본 블랙, 이산화 타이타늄이 바람직하게 이용되고, 착색 안료는 이산화 타이타늄을 포함하는 것이 보다 바람직하다. In particular, since the color strength is higher, carbon black, titanium dioxide is preferably used, the pigment is more preferably, including titanium dioxide. 착색 안료로서 이산화 타이타늄만을 이용한 경우에는 도막이 담색이 된다. When using only the titanium dioxide as the coloring pigment, the coating film becomes a light color. 이를 회피하기 위해서는, 다른 착색 안료와 병용하면 된다. In order to avoid this, and when used in combination with other colored pigments. 특히 후막인 도막을 형성하기 위한 본 발명에 따른 착색 도료에 있어서는, 비교적 작은 하지(下地) 은폐성을 가질 것이 필요하므로, 착색 안료의 함유량은 비교적 작은 것이 바람직하다. Especially so in the colored coating in accordance with the present invention for forming a thick film of the coating film, to have a relatively small not (下地) hiding required, the content of coloring pigments is preferably relatively small. 구체적으로는, 착색 안료의 함유량은, 도막 형성 성분 중, 통상 0.01∼3용량%이고, 바람직하게는 0.1∼2용량%이다. Specifically, the content of the coloring pigment, the coating film-forming component is usually 0.01 to 3% by volume, and preferably from 0.1 to 2% by volume. 착색 안료의 함유량이 너무 작으면, 하지 은폐력이 지나치게 작아, 도공 도중의 웨트 도막의 색상의 변화도 과도하게 작아지기 때문에, 규정의 막 두께에 도달했는지 여부를 판정하는 것이 곤란해진다. When the content of the color pigment is too small, the hiding power is not too small, since even excessively small change in the color of the wet film during the coating, it is difficult to determine whether the film reaches a thickness of the regulation. 한편, 착색 안료의 함유량이 너무 크면, 하지 은폐력이 지나치게 커져, 목표로 하고 있는 건조 도막 두께의 설정값 T에 도달하기 전에 도막이 피도물 표면을 은폐해 버리기 때문에, 동일하게, 규정의 막 두께에 도달했는지 여부를 판정하는 것이 곤란해진다. On the other hand, when the content of the color pigment is too large, not hiding power is too large, since the throw to cover up the coating film pidomul surface before it reaches the target, set the dry film thickness values ​​T, equal to, that of the prescribed film reaches a thickness to determine whether it is difficult. 착색 도료는, 평균 입자경이 10∼300μm, 평균 두께가 2∼50μm, 평균 입자경/평균 두께로서 정의되는 어스펙트비가 2∼100인 인편상(편평상) 안료(이하, 간단히 「인편상 안료」라고도 한다)를 포함한다〔조건(a)〕. Colored pigment, the average particle size of 10~300μm, an average thickness of 2~50μm, average particle size / aspect ratio, defined as average thickness of 2 to 100 scaly (Pt normal) pigment (hereinafter simply referred to as "flaky pigment", also known as and a is) [condition (a)]. 평균 입자경, 평균 두께 및 어스펙트비의 정의 및 측정 방법은 실시예의 항에 기재된 대로이다. Definition and measurement of the average particle diameter, average thickness and aspect ratio are the same as described in the embodiment section. 상기 인편상 안료를 함유시키는 것의 의의는 다음과 같다. Significance of what is contained the flaky pigment is as follows. 도료(방식 도료 등)에 있어서, 도막 강도를 높이기 위해서, 또는 방식 도료라면 내식성을 높이기 위해서 체질 안료를 함유시키는 것 자체는 관용의 기술이고, 체질 안료 및 착색 안료의 쌍방을 포함하는 막 두께 판정 도료도 알려져 있다(상기 특허문헌 1 및 2). Coating (anticorrosive coating, etc.) the method, in order to enhance the film strength, or anticorrosive coating, if one of adding an extender pigment in order to improve the corrosion resistance itself is a technique of tolerance, the film thickness determination paint containing the sides of the extender pigment and coloring pigment It is also known (Patent Document 1 and 2). 그러나, 종래의 막 두께 판정 도료에 있어서는, 전술한 대로, 후막인 도막을 1회 칠로 형성하는 방법에 적용하면, 목표의 막 두께(목표로 하는 건조 도막 두께의 설정값 T)에 꽤 가까워져 있는 도막과 목표의 막 두께에 도달한 도막의 색차를 충분히 크게 하는 것이 어려워, 웨트 도막이 목표의 막 두께에 도달했는지, 또는 아직 막 두께 부족인지를 판정하는 것이 용이하지 않다는 문제가 있었다. However, in the conventional film thickness determination paint, as described above, by applying the method for forming a thick film of the coating film once fill and coat film with fairly closer to the film thickness (on a dry film thickness of a target value T) of the target the film difficult to sufficiently increase the color difference in the coating film reaches a target thickness, has reached a thickness of the wet coating film target, or there has been a problem is not easy to determine if the still insufficient thickness. 상기 종래의 문제점을, 건조 막 두께(μm)를 가로축으로 하고, 그 건조 막 두께를 갖는 도막과 목표로 하고 있는 건조 도막 두께의 설정값 T를 갖는 도막의 색차 ΔE를 세로축으로 하는, 도 1에 나타내는 비교예 5의 그래프를 참조하여 보다 상세하게 설명하면, 도시된 바와 같이, 건조 막 두께가 커지면 ΔE가 (이른바 지수 함수적으로) 급격하게 단조 감소하여 그래프의 저변 영역, 즉 건조 도막 두께의 설정값 T(도 1에서는 320μm) 및 그 바로 앞의 근방 영역에서 ΔE에 차가 거의 생기지 않는 상태(즉, 목표의 막 두께에 꽤 가까워져 있는 도막과 목표의 막 두께에 도달한 도막의 색차가 극히 작은 상태)가 된다는 것을 알 수 있다. The above conventional problems, the dry film and the thickness (μm) as abscissa and, for the color difference ΔE of the coating film having a set value T of the dry film Dry film thickness that a film with a target having a thickness in the vertical axis in Fig. 1 Referring to the comparison graph of example 5 shown in more detail than, greater the dry film thickness ΔE abruptly monotonically decreasing (the so-called exponentially) with base areas of the graph, that is, setting of the dry film thickness, as illustrated value T (in FIG. 1 320μm) and a right difference substantially does not occur (i.e., the color difference of a coated film reaches the film and the target film thickness, which quite closer to the film thickness of the target is extremely small state in ΔE in the front vicinity of the region of ) you can see that. 이 문제는 1회 칠로 형성하는 도막 두께가 클수록 현저해지는데, 이는 건조 도막 두께의 설정값 T를 크게 할수록, 상기의 ΔE에 차가 거의 생기지 않는 저변 영역이 광범위하게 퍼지기 때문이다. The problem is that once a form fill and makin remarkably larger the film thickness, which is spread to a wide difference in base region hardly occur in the ΔE The larger the set value T of the dry film thickness, which. 한편, 종래의 막 두께 판정 도료 및 그것을 이용한 도막 형성 방법의 문제점을, 비교예 5를 참조하여 설명했지만, 비교예 5의 도료 및 그것을 이용한 도막 형성 방법이 종래 기술에 속한다는 것을 자인(自認)하는 것은 아니다. On the other hand, the problem of the coating film formation method using determination conventional film thickness coating material and that, in Comparative Examples refer to 5 to explain, but, the coating material and the coating film formation method using that of Comparative Example 5, (自認) acknowledge that they belong to the prior art It is not. 이에 비하여, 상기 인편상 안료를 포함하는 본 발명의 착색 도료 및 그것을 이용한 도막 형성 방법에 의하면, 예를 들면 도 1에 나타내는 실시예 14의 그래프를 참조하여, 건조 막 두께 대(對) ΔE의 그래프가, 지수 함수적인 급격한 단조 감소가 아니라, 건조 막 두께 0μm와 건조 도막 두께의 설정값 T 사이에 있어서, 비교예 5와 같은 급격한 단조 감소의 형상과 비교하여, ΔE가 큰 측으로 조금 상승한 것과 같은 형상을 채용하게 된다. In contrast, the graph of the according to the film forming method using the colored pigment and that of the present invention comprising a flaky pigment, for example the embodiment 14 with reference to a graph, dried for (對) thickness of indicating to 1 ΔE is, exponential, rather than abrupt monotonically decreasing, in between the set value of the dry thickness 0μm and the dry film thickness T, as compared with the shape of a sharp monotonically decreasing as compared to example 5, the shape as ΔE is slightly increased toward the large to become employed. 이와 같은 형상에 의해, 「건조 도막 두께 T를 갖는 도막과, 건조 도막 두께가 0.7T인 도막의 색차 ΔE1이 2.0 이상」이라는 조건〔조건(d)〕의 실현이 가능해져, 즉, 목표의 막 두께(목표로 하는 건조 도막 두께의 설정값 T)에 꽤 가까워져 있는 도막과 목표의 막 두께에 도달한 도막의 색차를 충분히 크게 하는 것이 가능해져, 웨트 도막이 목표의 막 두께에 도달했는지, 또는 아직 막 두께 부족인지를 용이하게 판정할 수 있게 된다. By such shapes, it becomes possible to realize the condition that "the coating film having a dry film thickness T, and the color difference ΔE1 of the dry film thickness coating 0.7T 2.0 or higher" [Condition (d)], that is, the target film the thickness that the thickness of it becomes (setting of the dry film thickness for the target value T) fairly approached sufficiently large color difference in the coating film reaches a thickness of the film and the target in it possible to wet coat the target is reached, or yet membranes it is possible to easily determine if the lack of thickness. 상기와 같은 그래프 형상이 되는 이유는 확실하지는 않지만, 원래 체질 안료는 광을 흡수하여 광의 투과를 방해하는 성분인 바, 후막이 됨과 더불어 인편상 안료가 도막의 면 방향으로 배향(인편상 안료의 장경 방향이 도막의 면 방향으로 배향)되기 쉬워져, 이에 수반하여 광이 인편상 안료를 투과하기 쉬워지는 것이 생각되고, 이것이 상기와 같은 그래프 형상이 되는 한 요인이라고 생각된다. The reason that this graph shape as described above is not sure, the original extender pigment is a component of the bar, scaly pigment with soon as the thick-film that absorbs light to interfere with the transmission of light oriented in the surface direction of the coating film (long diameter of the scaly pigment tends to be oriented in the direction of the plane of the film), is thought to entail that the light is easily transmitted through the scaly pigment thereto, is considered to be a factor in this is that this graph shape as described above. 상기 조건(d)의 충족성 및 도료·도막 물성의 관점에서, 인편상 안료의 평균 입자경은 10∼300μm가 되고, 바람직하게는 10∼200μm, 보다 바람직하게는 10∼150μm가 된다. In the adequacy and the point of view of coating, the coating film physical properties of the above-mentioned conditions (d), the average particle size of the flaky pigment is a 10~300μm, is a preferably 10~200μm, and more preferably from 10~150μm. 평균 입자경이 10μm 미만인 경우, 상기 조건(d)의 실현이 곤란해진다. When the average particle size of less than 10μm, the realization of the condition (d) becomes difficult. 또한, 평균 입자경이 10μm 미만이면, 인편상 안료의 흡유량이 많아지고, 이에 수반하여 도료 점도가 높아지기 때문에, 도공 작업성이 저하된다. Further, the average particle size is less than 10μm, the oil absorption of the flaky pigment is large, because of accompanied by a paint viscosity becomes high to, the coating workability is lowered. 평균 입자경이 300μm를 초과하는 경우도 상기 조건(d)의 실현이 용이하지는 않고, 또한 도막의 표면 평활성이 손상된다. When the average particle diameter exceeding 300μm also does not facilitate the implementation of the condition (d), also damage the surface smoothness of the coating film. 상기 조건(d)의 충족성 및 도료·도막 물성의 관점에서, 인편상 안료의 어스펙트비는 2∼100이 된다. In the adequacy and the point of view of coating, the coating film physical properties of the above-mentioned conditions (d), the aspect ratio of the flaky pigment is from 2 to 100 a. 어스펙트비는 어느 정도 높은 편이 전술의 그래프의 상승을 크게 하기 쉽고, 따라서 어스펙트비는, 바람직하게는 3 이상, 보다 바람직하게는 4 이상이다. The aspect ratio is somewhat high side is easy to increase the rise of the above-described graph, and thus the aspect ratio is preferably at least 3, more preferably at least four. 어스펙트비가 2 미만인 것은 조건(d)의 실현상 불리하다. An aspect ratio less than 2, it is disadvantageous condition of the developing chamber (d). 한편, 어스펙트비가 과도하게 크면, 인편상 안료에 의한 도막의 보강 효과가 불충분해져, 도막 강도나, 방식 도료라면 내식성이 저하된다. On the other hand, the aspect ratio is excessively large, it becomes the reinforcing effect of the coating according to the flaky pigment is insufficient, if the film strength or anticorrosive coating the corrosion resistance is lowered. 따라서 어스펙트비는, 바람직하게는 20 이하이다. Therefore, the aspect ratio is preferably 20 or less. 인편상 안료의 평균 두께는 2∼50μm가 된다. The average thickness of the flaky pigment is a 2~50μm. 평균 두께의 바람직한 범위는, 상기 평균 입자경의 바람직한 범위 및 상기 어스펙트비의 바람직한 범위로부터 유도되는 범위일 수 있고, 예를 들면 2∼30μm(예를 들면 2∼20μm)의 범위일 수 있다. A preferable range of the average thickness, may be in the range derived from the preferable range and the preferable range of the aspect ratio control of the average particle size, for example, it may be in the range of 2~30μm (e.g. 2~20μm). 인편상 안료는 굴절률이 1.8 이하인 것이 바람직하고, 1.7 이하인 것이 보다 바람직하며, 1.6 이하인 것이 더 바람직하다. Scaly pigment and the refractive index is more preferably not more than preferably, 1.7 and 1.8 or less, more preferably 1.6 or less. 굴절률을 작게 해서, 도막에 있어서의 바인더 수지와 인편상 안료의 계면에서의 광반사를 억제하여 광투과량을 크게 함으로써 상기 조건(d)를 보다 실현하기 쉽게 할 수 있다. To realize than the above-mentioned conditions (d) to, by reducing the refractive index, increasing the binder resin and the light transmission amount to suppress light reflection at the interface between the flaky pigment in the coating film can be easily. 굴절률의 측정 방법은 실시예의 항에 기재된 대로이다. Of the refractive index measurement method are the same as described in the embodiment section. 인편상 안료는 체질 안료일 수 있고, 구체적으로는 탈크, 마이카(운모), 클레이, 글라스 플레이크, 수산화 알루미늄 등일 수 있다. Scaly pigment may be an extender pigment, specifically, may be an aluminum talc, mica (mica), clay, glass flake, hydroxide. 바람직하게는 탈크, 마이카(운모), 클레이, 글라스 플레이크이고, 보다 바람직하게는 탈크, 마이카(운모), 글라스 플레이크이다. Preferably, talc, mica (mica), and clay, glass flake, and more preferably from talc, mica (mica), the glass flake. 착색 도료는 1종 또는 2종 이상의 인편상 안료를 함유할 수 있다. Colored coating may contain a scaly pigment one or two or more. 착색 도료는 인편상 안료 이외의 다른 체질 안료를 함유할 수 있다. Colored coating may contain other extender pigment other than a flaky pigment. 다른 체질 안료는 평균 입자경, 평균 두께 또는 어스펙트비 중 어느 하나 이상이 상기 소정의 범위를 만족시키지 않는 편평상의 체질 안료여도 되고, 어스펙트비가 1 또는 약 1의 입상 체질 안료여도 된다. Other extender pigment has an average particle size, is any one or more of the average thickness or aspect ratio, and even on the flat extender pigments that do not satisfy the range of the predetermined, or may be an aspect ratio of 1 or granular extender pigment of about 1. 다른 체질 안료는 인편상 안료와 동일한 재질이어도 되고, 상이한 재질이어도 되며, 그의 구체예는, 인편상 안료에 대하여 기술한 것 외에, 탄산 칼슘, 탄산 마그네슘, 황산 바륨, 실리카, 알루미나, 벤토나이트, 규산, 규산염, 산화 알루미늄 수화물, 황산 칼슘을 포함한다. Other extender pigment is scale may be either the same material as that of the pigment, and may be a different material, whose specific examples include, other than that described for the scaly pigment, calcium carbonate, magnesium carbonate, barium sulfate, silica, alumina, bentonite, silicic acid, It comprises a silicate, aluminum oxide hydrate, calcium sulfate. 착색 도료는 1종 또는 2종 이상의 다른 체질 안료를 함유할 수 있다. Colored coating may contain other extender pigment one or two or more. 인편상 안료의 함유량은, 도막 형성 성분 중, 5∼45용량%가 되고〔조건(b)〕, 바람직하게는 10∼40용량%(예를 들면 15∼35용량%)가 된다. The content of the flaky pigment is, of the coating film-forming component, and a 5 to 45% by volume [Condition (b)], preferably 10 to 40% by volume (for example 15 to 35% by volume) is a. 인편상 안료의 함유량이 5용량% 미만이면, 이것을 배합하는 것에 의한 전술의 효과가 얻어지지 어렵고, 또한 다른 체질 안료를 병용하지 않는 경우에는, 도막의 보강 효과가 불충분해져, 도막 강도나, 방식 도료라면 내식성이 불충분해진다. The content of the flaky pigment is less than 5 vol%, it is difficult to effect the above. By blending this is not obtained, and when not used in combination with other extender pigment, becomes the reinforcing effect of the coating film is insufficient, the coating film strength and, anticorrosive coating If the corrosion resistance becomes insufficient. 또한, 45용량%를 초과하면, 조막성이 저하된다. Further, if it exceeds 45 vol%, the film forming property is lowered. 인편상 안료와 다른 체질 안료를 병용하는 경우, 그들의 합계 함유량을, 도막 형성 성분 중, 45용량% 이하로 하는 것이 바람직하다. When used in combination scaly pigment and other extender pigments, of their total amount, the coating film-forming components, it is preferably not more than 45% by volume. 또한, 인편상 안료와 다른 체질 안료를 병용하는 경우, 상기 조건(d)의 충족성의 관점에서, 그들의 합계 함유량에서 차지하는 인편상 안료의 함유량은 10용량% 이상으로 하는 것이 바람직하고, 20용량% 이상으로 하는 것이 보다 바람직하며, 30용량% 이상으로 하는 것이 더 바람직하다. Also, scaly pigments and are used in combination the other extender pigment, in meeting the viewpoint of the condition (d), the content of the flaky pigment share of their total content, and preferably to 10 vol.% Or more, 20 vol% or more more preferably in that, more preferably of 30% by volume or more. 착색 도료는 상기 바인더 수지를 경화시키기 위한 경화제를 추가로 함유할 수 있다. Colored coating may further contain a curing agent for curing the binder resin. 경화제로서는, 종래 공지의 것을 사용할 수 있고, 에폭시 수지 또는 변성 에폭시 수지용의 경화제로서는, 아민계, 폴리아마이드계 또는 폴리아이소사이아네이트 화합물계의 경화제를 적합하게 이용할 수 있다. As the curing agent, it is possible to use the conventionally known, epoxy resins or modified epoxy resin of a curing agent, it can be preferably used an amine, polyamide, or polyisocyanate curing agent-based compounds. 경화제는 1종만을 단독으로 이용해도 되고, 2종 이상을 병용해도 된다. A curing agent is also possible to use the one species alone, or may be a combination of two or more. 아민계 경화제의 구체예는, 다이에틸렌트라이아민, 트라이에틸렌테트라아민, 에틸아미노프로필아민과 같은 쇄상 지방족 폴리아민; Specific examples of the amine-based curing agent, a chain aliphatic polyamine, such as diethylene tri-amine, triethylene tetra-amine, diethylaminopropyl amine; 환상 지방족 폴리아민; Cyclic aliphatic polyamine; 지방족 폴리아민 어덕트; Aliphatic polyamines air duct; 케티민; Ketimine; 변성 지방족 폴리아민; Modified aliphatic polyamine; 폴리아마이드 아민; Polyamide amine; 방향족 아민 또는 그의 변성물; Aromatic amines or their modified products; 다이아미노다이페닐메테인과 같은 방향족 폴리아민 또는 그의 변성물을 포함한다. It comprises an aromatic polyamine or a modified product such as diamino diphenyl methane. 폴리아마이드계 경화제의 구체예는, 폴리카복실산과 폴리아민의 중축합으로 얻어지는 지방족 폴리아마이드, 또는 이것에 방향족 환을 도입한 방향족 폴리아마이드, 지방족 폴리아마이드 어덕트, 방향족 폴리아마이드 어덕트를 포함한다. The polyamide-based embodiment of the curing agent, comprises a polycarboxylic acid and an aliphatic polyamide obtained by the polycondensation of a polyamine, or an aromatic polyamide which introduces an aromatic ring, the aliphatic polyamide air duct, an aromatic polyamide air duct. 폴리아이소사이아네이트 화합물계 경화제의 구체예는, 헥사메틸렌 다이아이소사이아네이트(HMDI)와 같은 지방족 폴리아이소사이아네이트; Specific examples of the polyisocyanate compound curing agent, ah between hexamethylene diisocyanate between ah aliphatic carbonate, such as isopropyl (HMDI) carbonate; 아이소포론 다이아이소사이아네이트(IPDI)와 같은 지환족 폴리아이소사이아네이트; Isophorone diisocyanate Oh Oh between cycloaliphatic polyester, such as a carbonate (IPDI) isocyanate; 다이페닐메테인-4,4'-다이아이소사이아네이트(MDI)와 같은 방향족 폴리아이소사이아네이트; Oh between diphenyl methane-4,4'-diisocyanate ah between the aromatic polyester, such as isopropyl (MDI) carbonate; 수첨 MDI와 같은 방향족 폴리아이소사이아네이트의 수첨물; An aromatic poly-iso-like hydrogenated MDI ah number of carbonate cheommul; 이들 폴리아이소사이아네이트 화합물의 작용기를 부분적으로 또는 완전히 블록한 블록 아이소사이아네이트를 포함한다. These poly isobutyl comprised between Ah between the functional groups of the carbonate compound partially or completely block a block isocyanate. 경화제에 의한 광의 흡수를 억제하여 상기 조건(d)를 보다 실현하기 쉽게 하는 관점에서, 경화제의 가드너 색수는 18 이하인 것이 바람직하고, 16 이하인 것이 보다 바람직하다. In view to suppressing the light absorption by the curing agent easily to realize than the above-mentioned conditions (d), Gardner number of colors of the curing agent is preferably not more than 18, more preferably 16 or less. 가드너 색수의 측정 방법은 실시예의 항에 기재된 대로이다. How to measure the Gardner number of colors are the same as described in the embodiment section. 경화제의 함유량은 통상의 양이면 되고, 바인더 수지 100질량부당, 예를 들면 5∼200질량부 정도이며, 바람직하게는 20∼100질량부 정도이다. The content of the curing agent is usually positive, and a binder resin per 100 parts by mass, for example, approximately 5 to 200 parts by weight, preferably 20 to 100 parts by mass or so. 경화제가 필요시되는 계에 있어서 경화제의 함유량이 5질량부 미만인 경우, 도막의 가교 밀도가 불충분해지고, 도막의 경도, 내후성, 내식성, 내열성, 내수성 등이 불충분해지기 쉽다. If in the system is less than the curing agent, if necessary the content of the curing agent 5 parts by mass, the crosslinking density of a coating film becomes insufficient, likely to be the hardness, weather resistance, corrosion resistance, heat resistance, water resistance, etc. of the coating film is insufficient. 또한, 경화제의 함유량이 200질량부를 초과하면, 도막이 취성이 되기 쉽다. On the other hand, if the content of the hardener exceeds 200 parts by mass, the coating film tends to be brittle. 착색 도료는 상기 이외의 다른 배합 성분을 1종 또는 2종 이상 함유할 수 있다. Colored coating may contain other components other than the at least one or two. 다른 배합 성분의 구체예는, 용제, 방청 안료, 처짐 방지제, 소포제, 자외선 흡수제, 표면 조정제, 점도 조정제, 레벨링제, 안료 분산제, 가소제를 포함한다. Specific examples of the other components, includes a solvent, anti-corrosive pigment, sag agent, a defoaming agent, an ultraviolet absorber, a surface adjusting agent, a viscosity adjusting agent, leveling agent, pigment dispersant, plasticizer. 다른 배합 성분의 함유량은, 착색 안료에 의한 선명한 색상이나 하지 은폐성을 저해하지 않고, 또한 착색 도료의 막 두께 판정 기능을 저하시키지 않을 정도로 하는 것이 바람직하다. The content of the other components are, but does not prevent the hiding or not bright color due to the color pigment, it is also preferable to do so with no decrease in the weight determining function of the colored coating film. 용제로서는 유기 용제를 적합하게 이용할 수 있고, 예를 들면, 톨루엔, 자일렌, 에틸벤젠과 같은 방향족 탄화수소; As the solvent there is suitably used an organic solvent, for example, aromatic hydrocarbons such as toluene, xylene, ethylbenzene; 사이클로펜테인, 옥테인, 헵테인, 사이클로헥세인, 화이트 스피릿 등의 지방족 또는 지환족 탄화수소류; Cyclopentanecarboxylic, octane, heptane, cyclohexane, aliphatic or alicyclic hydrocarbons such as white spirit; 주로 지방족 탄화수소로 이루어지고 약간의 방향족 탄화수소를 갖는 여러 가지의 비점 범위를 나타낼 수 있는 석유 유분; Petroleum fractions that may indicate a number of the boiling point range of mainly made of aliphatic hydrocarbons having some aromatic hydrocarbons; 다이옥세인, 테트라하이드로퓨란, 에틸렌글리콜 모노메틸 에터, 에틸렌글리콜 모노에틸 에터, 에틸렌글리콜 모노뷰틸 에터, 에틸렌글리콜 다이뷰틸 에터, 다이에틸렌글리콜 모노메틸 에터, 다이에틸렌글리콜 모노에틸 에터와 같은 에터류; Dioxane, tetrahydrofuran, ethylene glycol monomethyl ether, ethylene glycol monoethyl ether, ethylene glycol monobutyl ether, ethylene glycol dibutyl ether, diethylene glycol monomethyl ether, diethylene glycol ethers such as the monoethyl ether; 아세트산 뷰틸, 아세트산 프로필, 아세트산 벤질, 에틸렌글리콜 다이아세테이트, 2-에톡시에틸 아세테이트, 에틸렌글리콜 모노메틸 에터 아세테이트, 에틸렌글리콜 모노에틸 에터 아세테이트와 같은 에스터류; Butyl acetate, propyl acetate, benzyl acetate, ethylene glycol diacetate, an ester such as ethoxyethyl acetate, ethylene glycol monomethyl ether acetate, ethylene glycol monoethyl ether acetate, 2-like; 에틸 아이소뷰틸 케톤, 메틸 아이소뷰틸 케톤과 같은 케톤류; Ketones such as ethyl isobutyl ketone and methyl isobutyl ketone; n-뷰탄올, i-뷰탄올, t-뷰탄올, n-프로판올, i-프로판올, 벤질 알코올과 같은 알코올을 들 수 있다. There may be mentioned alcohols such as n- butanol, i- butanol, t- butanol, n- propanol, i- propanol, benzyl alcohol. 용제는 1종만을 단독으로 이용해도 되고, 2종 이상을 병용해도 된다. Solvent is also possible to use the one species alone, or may be a combination of two or more. 방수 안료의 구체예는, 황산 칼슘 반수염, 트라이폴리인산 알루미늄, 아인산 칼슘, 인산 아연, 사삼산화 납, 염기성 황산 납, 아산화 납, 사이안아마이드 납, 사이안아마이드 칼슘 아연, 몰리브데넘산 아연, 몰리브데넘산 알루미늄, 염기성 크로뮴산 납, 크로뮴산 아연, 크로뮴산 스트론튬, 크로뮴산 바륨과 같은 금속 화합물을 포함한다. Specific examples of the water resistant pigments, calcium sulfate half whisker tri polyphosphate of aluminum, calcium phosphite, zinc phosphate, four trioxide lead, basic lead sulfate, cuprous oxide of lead, calcium amide cyan not -amide lead, among zinc, molybdenum having neomsan zinc and molybdenum to include metal compounds such as aluminum neomsan, basic lead chromic acid, chromic acid zinc, chromium, strontium, chromium, barium. 바람직하게는, 백색계의 방청 안료이다. Preferably, the anti-corrosive pigments of the white-based. 착색 도료는, 바인더 수지, 착색 안료 및 인편상 안료, 및 필요에 따라서 배합되는 이들 이외의 배합 성분을, 볼 밀, 페블 밀, 롤 밀, 샌드 그라인드 밀, 고속 디스퍼 등의 혼합기를 이용하여 혼합하는 것에 의해, 조제할 수 있다. Colored pigment are mixed using a mixer such as a binder resin, a coloring pigment and a flaky pigment, and the compounding ingredients other than the above to be compounded, if necessary, a ball mill, pebble mill, roll mill, sand grinding mill, a high speed disper by, it can be prepared. 경화제를 이용하는 경우, 착색 도료는 주제와 경화제의 2액계여도 된다. When using a curing agent, a colored pigment may be either two of the liquid system and hardener. 본 발명에 따른 착색 도료는, 하기 조건(c) 및 (d)를 적어도 만족시키고, 바람직하게는 추가로 하기 조건(e)를 만족시키는, 막 두께 판정 기능이 우수한 도료이며, 적합하게는 방식 도료이다. Colored pigment according to the present invention, the following conditions (c) and (d) is at least satisfactory and, preferably, is excellent in film thickness determining function to more satisfy the following conditions (e) to the coating material, preferably anticorrosive coating to be. 한편, 하기 조건에 있어서의 「건조 도막 두께 T」는, 후술하는 대로, 300μm 이상의 범위로부터 선택되는 두께이다. On the other hand, as to described later, the "dry film thickness T 'of the condition, the thickness selected from the range of more than 300μm. (e) 설정된 건조 도막 두께 T를 갖는 착색 도료로 형성되는 도막과, 건조 도막 두께가 1.3T인 착색 도료로 형성되는 도막의 색차 ΔE2가 1 미만이다. (E) a predetermined dry film thickness T of the coating film, and the dry film thickness of the coating film formed from the colored coating 1.3T color difference ΔE2 less than 1 is formed of a colored pigment having. 색차 ΔE1, ΔE2 및 후술하는 ΔE3은 삼자극치 색채계 SM 컬러미터(형식 SM-T45, 스가시험기(주)제) 등의 색차계(색채계)를 사용하여, 일반적으로 인정된 방법에 의해 측정할 수 있다. Color difference ΔE1, ΔE2 and below ΔE3 is tristimulus value colorimeter SM using a color meter (Model SM-T45, Suga Testing Machine Co., Ltd. No.) color difference meter (color system), such as, to be measured by the generally accepted method can. 색차 ΔE1, ΔE2 및 ΔE3은 모두 절대값이다. Color difference ΔE1, ΔE2 and ΔE3 are all absolute values. 상기 조건(c)는 건조 도막 두께 T를 갖는 착색 도료로 형성되는 도막(여기에서 말하는 도막은 건조 도막이지만, 웨트 도막과 건조 도막의 하지 은폐성은 거의 동일하다)의 피도물 표면의 은폐성을 규정하는 것이다. The condition (c) is to define the hiding of pidomul surface of the coating film (coating film mentioned here is but dry film, not of the wet film and the dry film cover castle is almost the same) formed of a colored coating having a thickness of dried coating film T will be. 착색 도료를 피도물 표면에 도공해 가면, 그 도막 두께가 커짐에 따라, 피도물 표면의 「내비침」의 정도가 작아진다. Masked by coating the colored pigment in pidomul surface, depending on its film thickness becomes larger, the degree of "radiant", the smaller the pidomul surface. 피도물 표면의 색상이 소실되어, 도공면의 색상이 착색 도료로 이루어지는 도막의 색상과 동일해졌을 때, 착색 도료로 형성되는 도막이 피도물의 표면을 은폐했다고 판단된다. Pidomul is the color of the surface disappears, when the coated surface became in the same color as the color of the coating film made of a colored pigment, it is determined that cover the surface of the coating film formed from a colored coating pidomul. 본 발명에 따른 착색 도료는, 이와 같은 피도물 표면의 은폐를 건조 도막 두께 T 또는 그것 이상의 건조 도막을 형성할 때 달성할 수 있는 것이다. Colored pigment according to the present invention is achievable when forming such a surface pidomul dry film thickness T or more its dry film of the cover. 착색 도료로 형성되는 건조 도막의 은폐성은 JIS K 5600-4-1: 1999에 준거하는 은폐율에 의해 평가할 수도 있다. Concealment of the dry film formed from a colored coating castle JIS K 5600-4-1: may be evaluated by a cover rate that conforms to 1999. 상기 조건(c)를 충족시키기 위해서, 건조 도막 두께 T를 갖는 착색 도료로 형성되는 도막은 은폐율이 0.90∼0.98인 것이 바람직하고, 0.92∼0.98(예를 들면 0.92∼0.96)인 것이 보다 바람직하다. In order to meet the condition (c), the coating film formed from a colored coating having a dry film thickness T is more preferably it is preferred that the cover rate from 0.90 to 0.98, from 0.92 to 0.98 (e.g. 0.92 to 0.96) . 상기 조건(d)는, 착색 도료로 형성되는 건조 도막에 있어서, 그 막 두께가 목표로서 설정된 건조 도막 두께 T일 때와 0.7T일 때의 색차 ΔE1을 규정하는 것이다. The condition (d), in the dry film formed from a colored coating, to a thickness that defines the color difference ΔE1 the time of 0.7T and when the dry film thickness T is set as a target. 건조 도막 두께가 0.7T인 도막은 도공 완료 바로 전의 도막이다. Film of the dry film thickness is the film before the completion of the coating is 0.7T. 색차 ΔE1이 2.0 이상으로 큰 것은, 도공 완료 직전〔건조 도막 두께 T 바로 앞(0.7T)으로부터 건조 도막 두께 T에 걸쳐〕에 있어서의 도막 색상의 막 두께 의존성이 큰 것을 의미한다. Color difference ΔE1 is not large as 2.0 or more, it means that a large film thickness dependency of the color of the coating just before completion [immediately dry film thickness T over the film thickness T from the preceding drying (0.7T)]. 이에 의해, 건조 도막 두께 T에 꽤 가까워져 있는 도막과 건조 도막 두께 T에 도달한 도막의 색차를 충분히 크게 하는 것이 가능해지기 때문에, 웨트 도막이 목표의 막 두께에 도달했는지, 또는 아직 막 두께 부족인지를 용이하게 판정할 수 있게 되어, 건조 도막 두께 T를 갖는 건조 도막을 극히 정확하게 형성할 수 있고, 근소한 막 두께 부족도 해소할 수 있다. As a result, whether because a sufficiently large it possible for the color difference of a coated film reaches the film and the dry film thickness that fairly closer to the dry film thickness T T, has reached a thickness of the wet coating film target, or lacking thickness easily it is possible to determine, it is possible to form a dry film having a dry film thickness T is extremely accurate, it is also possible to solve the lack small film thickness. 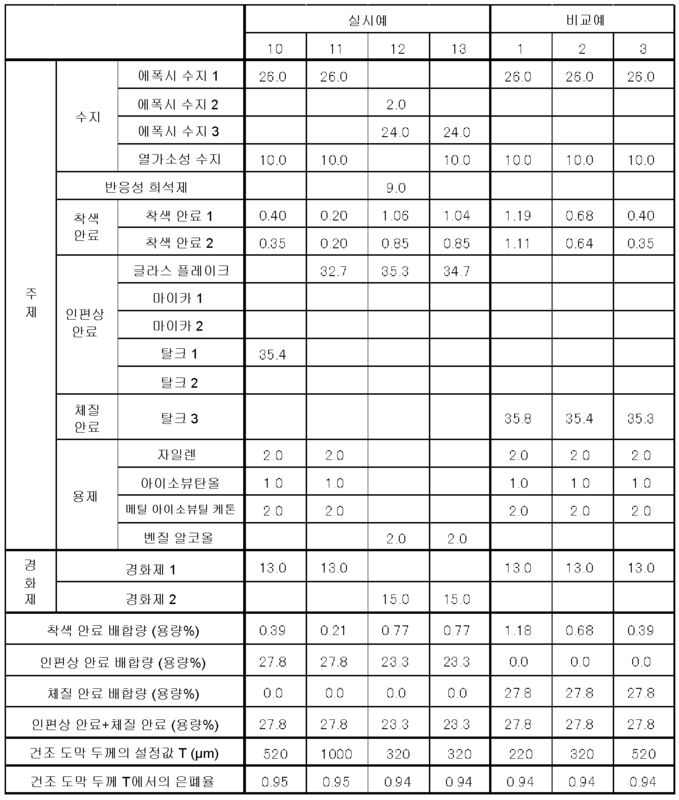 색차 ΔE1은, 바람직하게는 2.1 이상이고, 보다 바람직하게는 2.5 이상이며, 더 바람직하게는 3.0 이상이다. Color difference ΔE1 is preferably not less than 2.1, more preferably not less than 2.5, more preferably 3.0 or more. 단, 색차 ΔE1이 너무 지나치게 크면, 근소한 막 두께의 차로 색 불균일이 생기기 쉬워지기 때문에, 색차 ΔE1은 바람직하게는 10 이하, 보다 바람직하게는 5 이하이다. However, since the color difference ΔE1 is too is too large, easily caused a small film thickness of the color irregularity by car, the color difference ΔE1 is preferably 10 or less, more preferably 5 or less. 전술한 바와 같이, 본 발명에 있어서, 300μm 이상의 후막인 도막을 형성할 때의 색차 ΔE1 「2.0 이상」의 실현은 주로 인편상 안료의 적용에 의한다. As described above, according to the present invention, the color difference ΔE1 realization of "2.0 or higher" at the time of forming a thick coating film of 300μm or more is mainly caused by the application of the flaky pigment. 건조 도막 두께 T에 꽤 가까워져 있는 도막과 건조 도막 두께 T에 도달한 도막의 색차를 충분히 크게 하여, 웨트 도막이 목표의 막 두께에 도달했는지, 또는 아직 막 두께 부족인지를 보다 용이하게 판정할 수 있도록 하기 위해서, 설정된 건조 도막 두께 T를 갖는 착색 도료로 형성되는 도막과, 건조 도막 두께가 0.8T인 착색 도료로 형성되는 도막의 색차 ΔE1'는, 1.0 이상인 것이 바람직하고, 1.1 이상인 것이 보다 바람직하며, 1.2 이상(예를 들면 1.5 이상)인 것이 더 바람직하다. To the well closer the color difference of the film and the dry film coating film reaches a thickness T in a dry film thickness T large enough, has reached a thickness of the wet coating film target, or to be able to more easily determine if the still insufficient thickness in order, the color difference of the film and the coating film formed from the colored pigment is formed from a dry film thickness 0.8T colored coating having a dry film thickness T is set ΔE1 'is, and preferably not less than 1.0, more preferably not less than 1.1, 1.2 that the higher (e.g. more than 1.5) is more preferred. 마찬가지의 이유로, 설정된 건조 도막 두께 T를 갖는 착색 도료로 형성되는 도막과, 건조 도막 두께가 0.9T인 착색 도료로 형성되는 도막의 색차 ΔE1''는, 0.5 이상인 것이 바람직하고, 0.6 이상인 것이 보다 바람직하며, 0.7 이상인 것이 더 바람직하다. The same reason, the color difference of the film and the coating film formed from the colored pigment is formed from a dry film thickness 0.9T colored coating having a dry film thickness T is set ΔE1 '' is, and preferably not less than 0.5, more preferably not less than 0.6 and it is more preferably not less than 0.7. 상기 조건(e)는, 착색 도료로 형성되는 건조 도막에 있어서, 그 막 두께가 목표로서 설정된 건조 도막 두께 T일 때와 1.3T일 때의 색차 ΔE2를 규정하는 것이다. The condition (e), in the dry film formed from a colored coating, the film thickness is specified to a color difference ΔE2 the time of 1.3T and when the dry film thickness T is set as a target. 건조 도막 두께가 1.3T인 도막은 도공 완료 후(또는 직후)의 도막이다. In a dry film thickness of the coating film is a coating film of 1.3T after complete coating (or shortly after). 색차 ΔE2가 1 이상이 되면, 건조 도막 두께 T를 갖는 도막과 건조 도막 두께 T를 초과하는 도막 사이의 색차가 커져, 색 불균일이 생기기 쉬워진다. When the color difference ΔE2 least 1, increases the color difference between the coating film and the dry film thickness in excess of the T having a dry film thickness T, it tends to occur a non-uniform color. 색차 ΔE2는, 바람직하게는 0.5 이하, 보다 바람직하게는 0.4 이하(예를 들면 0.2 이하)이다. A color difference ΔE2 is preferably 0.5 or less, more preferably 0.4 or less (e.g. 0.2 or less). 설정된 건조 도막 두께 T를 갖는 착색 도료로 형성되는 도막과, 피도물의 표면의 색차 ΔE3이 클수록, 도장 중의 도막 두께가 목표로 하는 막 두께에 가까워짐에 따라 피도물과의 색차가 변화하는 모습을 육안으로 확인하는 것이 용이해지기 때문에, 웨트 도막이 목표의 막 두께에 도달했는지, 또는 아직 막 두께 부족인지의 판정이 보다 용이해진다. The larger the film and the color difference ΔE3 of the surface of the pidomul formed from a colored coating having a predetermined dry film thickness T, check the appearance of the color difference between the pidomul change with the naked eye, depending on the film thickness of the coating approaches the film thickness aiming since it is easy to, it has reached a thickness of the wet coating film target, or it is still more easy determination of whether the lack of film thickness. 따라서, 색차 ΔE3은 20 이상인 것이 바람직하고〔조건(f)〕, 25 이상인 것이 보다 바람직하며, 30 이상인 것이 더 바람직하다. Accordingly, the color difference ΔE3 is not less than 20 is preferable, and more preferably at least [condition (f)], 25, is more preferably not less than 30. 색차 ΔE3이 너무 작으면, 도막에 의해 피도물 표면이 은폐되었는지를 확인하는 것이 곤란해지기 쉽다. If ΔE3 color difference is too small, it is likely to be difficult to ensure that the coating film by pidomul surface is opaque. 이상의 조건을 만족시키는 착색 도료는, 인편상 안료를 소정량 함유시키는 것을 전제로 하여, 착색 안료의 종류(색상)의 선택 및 그의 함유량의 조정에 의해 얻을 수 있다. Colored pigment that meet the above conditions, and the flaky pigment to be contained on the assumption that the predetermined amount can be obtained by selection and adjustment of its content of the type of colored pigment (color). 착색 안료의 함유량에 따라서, 그 착색 도료의 건조 도막 두께 T의 설정값을 조정할 수 있다. Therefore, the content of the color pigment, it is possible to adjust the setting of the dry film thickness T of the colored pigment. 즉, 기본적으로는, 착색 안료의 함유량을 보다 작게 하는 것에 의해, 그 착색 도료의 건조 도막 두께 T의 설정값을 보다 크게 할 수 있다. That is, basically, by less than the content of the color pigment, it is possible to set the value of the dry film thickness T of the colored pigment larger. 환언하면, 건조 도막 두께 T의 설정값은, 그 도막에 요구되는 내식성 등의 도막 특성이나 피도물의 종류 등으로부터 정해져 오기 때문에, 당해 건조 도막 두께 T의 설정값에 적합하도록 착색 안료의 함유량이 조정된다. In other words, the set value of the dry film thickness T is, because it comes determined from the coated film characteristics or the type of pidomul such as corrosion resistance, etc. required for the coating film, and the content of the color pigment adapted to fit to the set value of the art dry film thickness T .
본 발명에 따른 도막 형성 방법은, 그것에 포함되는 각 공정으로부터 이해할 수 있는 바와 같이, 1회 칠에서의 도막 형성 방법을 규정한 것이지만, 이 1회 칠에서의 도막 형성 방법을 포함하는 한, 모든 도막 형성 방법이 본 발명에 포함된다. One comprising a film forming method in the film forming process according to the invention, as can be understood from the respective steps included in it, but by defining the film forming method for a one-time fills, the fill is once, every coating film this forming method is included in the present invention. 예를 들면, 본 발명에 따르는 1회 칠에서의 도막 형성 방법을 포함하여, 복수회 칠로 원하는 막 두께를 확보한 건조 도막을 얻는 방법도 본 발명에 포함된다. For example, including a film forming method in a single paint according to the invention, a method of obtaining a plurality of times fills dry film obtained a desired film thickness is also included in the present invention. 이하, 각 공정에 대하여 상세하게 설명한다. It will now be described in detail for each step. 본 공정은 1회 칠로 형성되는 목표로 하는 건조 도막의 막 두께인 건조 도막 두께 T를 설정하는 공정이다. This step is a step for setting a one-time fills the dry film thickness The film thickness T of the dry film to a target to be formed. 본 발명에 있어서 건조 도막 두께 T는 300μm 이상의 범위로부터 선택된다. Dry film thickness in the present invention T is selected from the range of 300μm or more. 건조 도막 두께 T가 대략 300μm 이상일 때 비로소 본 발명이 해결해야 할 과제가 우려되고, 이 과제를 해결하기 위해서 본 발명의 방법이 유효한 수단이 된다. The dry film thickness T is a fear that problems to be solved by the present invention until time approximately 300μm or more, this is a valid means of the method of the present invention to solve this problem. 착색 도료 준비 공정에서 소정의 착색 도료를 조제 또는 준비하기 위해서는, 건조 도막 두께 T가 미리 설정되어 있을 필요가 있기 때문에, 본 공정은 착색 도료 준비 공정 전에 실시된다. In order to prepare the prepared or predetermined colored pigment in the colored coating preparing step, since it is necessary to have a dry film thickness T is set in advance, the process is carried out before the colored coating material preparing step. 건조 도막 두께 T는 피도물 표면에 최종적으로 형성되어야 할 건조 도막의 막 두께 그 자체여도 되고, 당해 건조 도막을 형성함에 있어서 형성되는 도중 단계의 건조 도막의 막 두께여도 된다. Dry film thickness T is even and finally that of the dry film to be formed in the film thickness itself pidomul surface, or may be the thickness of the dry film during the step to be formed in forming the dry film art. 전자의 예는 피도물 표면에 1회 칠로 최종적인 건조 도막을 형성하는 경우이고, 후자의 예는 복수회 칠로 최종적인 건조 도막을 형성하는 경우이다. The former example is the case of forming a single fill and final dry film on pidomul surface, the latter example is a case of forming a plurality of times fills the final dry film. 후자의 구체예로서, 예를 들면 1회 칠로 300μm 막 두께의 건조 도막을 형성한 후, 그 위에 300μm 막 두께의 건조 도막을 추가로 형성하여, 최종 목적으로 하는 600μm 막 두께의 건조 도막을 형성하는 것을 들 수 있다. As the latter embodiment, for example, one fills 300μm film after forming a thickness of the dry film, is formed by adding a dry film of 300μm thickness thereon, forming a 600μm dry film with a film thickness according to the final target It can be given. 피도물 표면에 최종적으로 형성되어야 할 건조 도막의 막 두께는 통상, 도막 형성에 의해 피도물 표면에 부여되어야 할 원하는 특성이 충분히 얻어지는 막 두께이다(예를 들면 방식 도막이라면 충분한 내식성이 얻어지는 막 두께). The thickness of the dry film to be finally formed in the pidomul surface is usually, the film thickness is sufficiently obtained the desired properties to be imparted to the surface by a coating film formed pidomul (e.g. if the anticorrosive coating film thickness sufficient corrosion resistance is obtained). 본 공정은 바인더 수지 및 착색 안료를 적어도 함유하고, 상기 조건(a)∼(d)〔바람직하게는 추가로 조건(e), (f)〕를 만족시키는 본 발명에 따른 착색 도료를 조제 또는 준비하는 공정이다. The present process contains a binder resin and a color pigment, at least the conditions (a) ~ (d) [preferably added to the condition (e), (f)], prepared or preparing a colored coating of the present invention to meet the a step for. 조제 방법을 포함하는 착색 도료의 상세에 대해서는 전술한 바와 같으므로, 여기에서는 할애한다. Is the same as described above for the details of the colored coating comprising a preparation method, the spent here. 본 공정은 피도물의 표면이 착색 도료로 이루어지는 도막에 의해 은폐될 때까지 착색 도료를 해당 표면에 도공하는 공정이다. This step is a step of applying a colored coating until the cover by coating the surface of the pidomul made of a colored coating to the surface. 이 공정에서는, 도공 도중의 도막(웨트 도막)과 피도물 표면의 색차의 변화를 관찰하면서 착색 도료를 피도물 표면에 도공해 간다. In this process, while observing the coating film (wet film) and the change in color difference in pidomul surface of the coating during the coating goes to the colored pigment to pidomul surface. 「도공 도중의 도막(웨트 도막)과 피도물 표면의 색차의 변화를 관찰한다」란, 전형적으로는, 도공면에 피도물 표면의 「내비침」이 생겨 있는지, 즉 도공 도중의 도막(웨트 도막)이 피도물 표면을 어느 정도 은폐하고 있는지를 관찰하는 것이다. "Observe the coating film (wet film) and the change in color difference in pidomul surface during coating and" is, typically, that the "radiant" of pidomul surface to coated surface blossomed, that is the coating film (wet film) during the coating pidomul to observe the surface that you are somewhat hidden. 보다 구체적으로는, 피도물의 표면에 착색 도료를 도공해 가는 것이지만, 도공 초기에서는, 도막 두께가 작기 때문에, 웨트 도막의 색상은 하지인 피도물 표면의 색상을 크게 반영한 것이 된다(즉 「내비침」이 크다). More specifically, but it goes to the coating a colored coating to the surface of the pidomul, the coating initially, because of the small film thickness, the color of the wet coating film is not significantly reflect the color of the pidomul surface to (i. E. "Show through my" Big). 이와 같이, 도공 도중의 도막(웨트 도막)의 색상의 피도물 표면의 색상에 대한 변화를 육안으로 관찰한다. Thus, to observe the changes in color of the surface of the pidomul color of the coating film (wet film) during the coating with the naked eye. 도막 두께가 커짐에 따라서 이 「내비침」은 작아져 가고, 피도물 표면의 색상이 웨트 도막의 색상에 반영되지 않게 되는 시점, 즉 웨트 도막이 피도물 표면을 은폐하는 시점에 도달한다. "Non-I" is in accordance with the film thickness increases to go is small, the time the color of the surface on which pidomul not be reflected in the color of the wet coating film, i.e., it reaches a point to cover the surface of the wet coating film pidomul. 웨트 도막의 하지 은폐성은, 건조 도막의 하지 은폐성과 거의 동일하므로, 이 시점에서의 웨트 도막의 도막 두께(피도물 표면이 은폐되었을 때의 웨트 도막의 도막 두께)는 목표로 하고 있는 건조 도막 두께 T에 대응하는 막 두께이다. A (film thickness of the wet film when the pidomul surface is opaque) is dry film thickness, which aims T castle not cover the wet coating film, since not a dry film substantially equal concealment performance, film thickness of the wet coating film at this point corresponding to the film thickness. 상기의 도공 방법에 있어서, 웨트 도막이 피도물 표면을 은폐했는지는 다음과 같이 해서 확인할 수 있다. In the coating method of the above, it is that the wet coating film pidomul opaque surface can be found as follows. 예를 들면, 목표로 하는 건조 도막 두께 T를 갖는 건조 도막을 구비한 색 견본을 미리 제작해 두고, 이 색 견본의 색상과 웨트 도막의 색상이 일치한 시점에서 웨트 도막이 피도물 표면을 은폐했다고 판단할 수 있다. For example, be determined with by making the color sample having a dry film having a dry film thickness T of the target in advance, that cover up the wet coating film pidomul surface at the time when the color of the color and the wet coating film of the color sample matches can. 또한, 도공을 행하고 있는 피도물 표면의 근방에, 이미 목표로 하는 막 두께로 도막을 형성한 영역이 존재하고 있는 경우에는, 이 영역의 도막의 색상과 웨트 도막의 색상이 일치한 시점에서 웨트 도막이 피도물 표면을 은폐했다고 판단할 수 있다. Further, in the vicinity of the pidomul surface subjected to coating, in the case of already existing one form a coating film with a thickness area to target, the wet coating film pidomul at the time when the color of the color and the wet coating film matching the film in the zone it can be determined that conceals the surface. 또한, 목표로 하는 건조 도막 두께 T를 갖는 건조 도막 및 이에 대응하는 웨트 도막의 색상과, 착색 도료 자체의 색상은 전형적으로는 동일하므로, 웨트 도막의 색상이 착색 도료 자체의 색상과 일치한 시점에서 웨트 도막이 피도물 표면을 은폐했다고 판단할 수도 있다. In addition, the dry film has a dry film thickness T of the target and hence the color of the color of the wet film and corresponding, colored pigment itself is typically the same, at the time when the color of the wet coating matches the color of the colored pigment itself It may determine that conceals the wet coat pidomul surface. 착색 도료의 도공 방법은 특별히 제한되지 않고, 예를 들면, 침지법, 스프레이법, 솔칠법, 롤러, 정전 도장 등의 종래 공지의 방법을 이용할 수 있다. The coating method of the colored coating material is not particularly limited, and for example, may be used dipping method, spraying method, brush chilbeop, a roller, a method conventionally known, such as electrostatic coating. 피도물은 특별히 제한되지 않고, 예를 들면, 비처리 강재, 블라스트 처리 강재, 산 처리 강재, 아연 도금 강재, 스테인리스 강재 등의 강재; Pidomul is not particularly limited, for example, steel, such as untreated steel, blasted steel, acid-treated steel, galvanized steel, stainless steel; 알루미늄(합금)재, 구리(합금)재 등의 비철 금속재; Aluminum (alloy) and non-ferrous metal material, such as material, copper (alloys) material; 콘크리트; concrete; 플라스틱 등으로 이루어지는 각종 구조물, 특히 수중 구조물 및 선박 등을 들 수 있다. There may be mentioned a variety of structures, particularly an underwater structure and the ship, such as made of plastic. 이들 강재 및 비철 금속재에는 용접선이 있어도 된다. These steels and non-ferrous metal material or may include a weld line. 수중 구조물의 구체예를 들면, 예컨대, 항만 시설; Specific examples of the marine structure, for example, for example, port facilities; 발전소 등의 취수 설비; Water intake facilities such as power plants; 냉각용 도수관 등의 배관; Pipes, such as for cooling dosugwan; 교량; Bridges; 부표; buoy; 공업용 수계 시설; Industrial water facilities; 해저 기지 등이다. Such as a submarine base. 착색 도료가 도공되는 피도물의 표면은 필요에 따라서 전처리된 것이어도 되고, 또한 하도층(도막)을 갖고 있어도 된다. Pidomul surface of the colored pigment is a coating that is even pretreated, if necessary, or may also have a primer layer (coating film). 당해 도막으로서는, 종래 공지의 방청 도료 조성물로 형성되는 숍프라이머(shopprimer)층; Examples of the art coating, shop primers (shopprimer) layer is formed of a rust-preventive coating composition according to the conventionally known; 본 발명에 따른 착색 도료를 이용하여 형성되는 도막이 방식 도막인 경우에 있어서의, 다른 방식 도막을 들 수 있다. In the case where the coating film anticorrosive coating film formed by using the colored coating in accordance with the present invention, there may be mentioned other coating methods. 위에서 이용한 구체예를 재차 인용하여 설명하면, 다른 방식 도막은, 예를 들면 1회 칠로 300μm 막 두께의 건조 도막을 형성한 후, 그 위에 300μm 막 두께의 건조 도막을 추가로 형성하여, 최종 목적으로 하는 600μm 막 두께의 방식 도막을 형성하는 경우에 있어서의 1단째의 건조 도막일 수 있다. Will be described with a specific example using the above re-quoted, other anticorrosive coating film, for example, to form as a one-time fills 300μm film after forming a thickness of the dry film, adding a dry film of 300μm thickness thereon, with the final target If 600μm film to form the thickness of the anticorrosive coating film, which may be a dry film of the first-stage of the. 피도물 표면에 하도층이 형성되는 경우, 상기 조건(c) 및 (f)에 있어서의 「피도물의 표면」이란, 하도 도막의 표면을 의미한다. If the undercoating layer formed on the surface pidomul, the condition (c) or the "surface of pidomul" in (f) is, a primer refers to the surface of the coating film. 상기 다른 방식 도막은 본 발명의 방법에 따라 형성된 것이어도 된다. The other method is a film It may be formed in accordance with the method of the invention. 이러한 착색 방식 도막 상에 추가로 방식 도막을 본 발명의 방법에 따라 형성하는 경우, 상기 조건(f)를 만족시키기 위해서는, 하지의 방식 도막을 형성하기 위한 착색 도료와, 그 위에 형성되는 방식 도막을 위한 착색 도료는 다른 색인 것이 바람직하고, 2개의 도료의 색차는 20 이상인 것이 바람직하다. In the case of forming an additional anticorrosive coating film in on such a colored anticorrosive coating film according to the process of the present invention, the colored coating material for forming the anticorrosive coating film of not in order to satisfy the condition (f),, the anticorrosive coating film formed thereon, for the colored coating material other index is desirable, and preferably at least two color difference of the two coatings are 20. 본 공정은 도공 공정에 의해 얻어진 도막(웨트 도막)을 건조시켜 건조 도막을 얻는 공정이다. The present step is a step of drying the coating film (wet film) obtained by a coating step for obtaining a dry film. 웨트 도막의 건조(및 경화)는 종래 공지의 방법을 이용할 수 있고, 실온 또는 그것 이하의 온도에서 행해도 되고, 가열하에서 행해도 된다. Drying the wet coating film (and curing) may be used conventionally known method, and may be carried out at room temperature or temperatures below it may be performed under heating. 얻어진 건조 도막 상에, 상도(上塗) 도료를 도공하여 상도 도막을 형성해도 된다. On a dry film obtained by coating the top coat (上 塗) coating is to form a topcoat coating film. 또한, 얻어진 건조 도막 상에 바인더 코트를 형성하고, 그 위에 상도 도료를 도공하여 상도 도막을 형성해도 된다. Further, to form a binder coating on the resultant dry film, or formed of the top coat film by coating a top coating material thereon. 상도 도료로서는, 에폭시 수지계 도료, 염화 고무 수지계 도료, 염화 바이닐 수지계 도료, 알키드 수지계 도료, 실리콘 알키드 수지계 도료, 아크릴 수지계 도료, 유레테인 수지계 도료, 불소 수지계 도료, 폴리에스터 수지계 도료, 에폭시 아크릴 수지계 도료, 폴리실록세인 수지계 도료 등으로부터 선택되는 1종 또는 2종 이상을 이용할 수 있다. As the top coating material, epoxy resin-based paints, chlorinated rubber resin paints, vinyl chloride resin-based paints, alkyd resin paints, silicone alkyd resin paints, acrylic resin paints, urethane resin paints, fluorine resin paints, polyester resin-based coating, an epoxy acrylic resin-based paint can be used alone or in combination of two or more selected from a resin such as polysiloxane coatings. 상도 도료는 수중 구조물 및 선박 등에 적용되는 방오 도료여도 된다. Top coating material may be either an antifouling paint that is applied to an underwater structure and the ship. 방오 도료로서는, 가수분해성기를 측쇄에 갖는 아크릴계 수지를 바인더 수지로 하는 방오 도료를 들 수 있다. As the antifouling paint, the antifouling paint may be an acrylic resin having a hydrolyzable group in the side chain of a binder resin. 가수분해성기는, 예를 들면 2가의 Cu나 Zn과 같은 금속 원자를 함유하는 금속 에스터기, 트라이알킬실릴 에스터기 등일 수 있다. The hydrolyzable group is, for example, may be a metal ester group, a trialkylsilyl ester group containing a metal atom such as divalent Cu and Zn. 본 발명에 따른 착색 도료를 이용한 도막 형성 방법에 의하면, 도공 중의 도막이 소정의 막 두께에 도달했는지를 용이하게 판정할 수 있기 때문에, 소정의 건조 막 두께를 갖는 균일한 도막을 정확하게 형성할 수 있다. According to the film forming method using a colored coating material according to the invention, because it can be easily determined whether to coat a predetermined thickness of the coating is reached, it is possible to form precisely a uniform coating film having a desired dry film thickness. 이에 의해, 종래 종종 발생한 막 두께 부족을 효과적으로 방지할 수 있다. This makes it possible to effectively prevent the prior art is often insufficient film thickness occurs. 또한, 과잉인 막 두께를 방지할 수도 있으므로, 도료의 절약을 도모할 수도 있다. Further, since also to prevent excessive film thickness, it is also possible to promote the saving of the paint. 또한, 본 발명에 따른 착색 도료를 이용한 도막 형성 방법에 의하면, 축차적으로 도막 두께의 측정을 행하여 소정의 막 두께에 도달했는지를 확인한다는 번잡한 작업을 회피할 수 있기 때문에, 도공 작업의 대폭적인 효율화를 도모할 수 있음과 더불어, 도공 작업자의 대폭적인 부담 경감을 도모할 수 있다. Further, according to the film forming method using a colored coating material according to the present invention, by performing the measurement of the film thickness by Recursive it is possible to avoid a troublesome work that the check has reached a predetermined thickness, significant efficiency of the coating operation in addition to that can be made, it is possible to achieve a significant reduction of burdens in view of the coating operator. 본 발명에 따른 착색 도료를 이용한 도막 형성 방법은 각종 구조물(특히 선박이나 수중 구조물)의 도장(예를 들면 방식 도장)에 적용할 수 있다. Film forming method using a colored coating material according to the present invention can be applied to coating (e.g., coating method) of various structures (in particular a ship or marine structure). 본 발명의 방법에 의하면, 선박 등과 같은 대형 구조물의 외면에 방식 도장을 실시하는 경우 등, 도공이 곤란한 구조물 또는 그 부위에 대해서도, 소정의 건조 막 두께를 갖는 균일한 도막을 정확하고 간편하게 형성할 수 있다. According to the method of the present invention, when subjected to an outer surface scheme coating on large structures such as ships or the like, the coating it is also a difficult structure or area, be accurate and form easily a uniform coating film having a desired dry thickness of the have. 이하, 실시예 및 비교예를 나타내어 본 발명을 더 구체적으로 설명하지만, 본 발명은 이들 예에 의해 한정되는 것은 아니다. More specifically the present invention represented by the following examples and comparative examples, but the present invention is not limited to these examples. 표 1 및 표 2에 나타내는 배합 조성에 따라, 옐로계의 2액형 착색 도료를 조제했다. In accordance with the blend composition shown in Table 1 and Table 2, to prepare a two-component colored pigment of the yellow-based. 표 1 및 표 2의 「주제」 및 「경화제」의 란에 있어서의 배합량의 단위는 「질량부」이다. Is the unit of the amount in the "subject" of Tables 1 and 2 and "curing agent" is "parts by weight". 주제는 이것을 구성하는 전체 성분을 글라스 비즈와 함께 페인트 쉐이커에 넣고, 충분히 혼합·분산시켜 조제했다. Subject put all the ingredients that make it a paint shaker together with glass beads was prepared and sufficiently mixed and dispersed. 표 1 및 표 2에는, 착색 안료, 인편상 안료 및 체질 안료(다른 체질 안료)의 배합량의 용량% 표시(도막 형성 성분 중의 용량%)를 아울러 나타내고 있다. Table 1 and Table 2, it shows a well (volume% in the coating film forming component), a coloring pigment, scaly pigment and extender pigment volume% of the amount of the display (other extender pigment). 도막 형성 성분이란, 착색 도료에 포함되는 용제 이외의 전체 성분을 의미한다. Film-forming component refers to a component of the total solvent contained in the non-colored coating. 또한, 각 착색 도료가 목표로 하고 있는 건조 도막 두께의 설정값 T, 및 건조 도막 두께 T를 갖는 각 착색 도료의 건조 도막의 은폐율(표 1 및 표 2에서는 「건조 도막 두께 T에서의 은폐율」로 표기하고 있다)을 아울러 나타내고 있다. Further, the cover rate of the dry film of each coloring the colored coating paint having the target and set the dry film thickness value T, and the dry film thickness T (in Tables 1 and 2 cover ratio in the "dry film thickness T is referred to as ") indicates the well. 표 1 및 표 2에 나타내는 약호는 하기와 같다. Abbreviations shown in Table 1 and Table 2 are as follows. 〔o〕 경화제 2: 다이토산업 주식회사제의 「다이토큐라르 D-6043」(변성 지방족 폴리아민, 가드너 색수: 5, 비휘발분: 100질량%, 비중: 1.1). [O] curing agent 2: Taito Industry Co., Ltd. "Taito queue L'D-6043" of the (modified aliphatic polyamine, a Gardner number of colors: 5, a non-volatile content: 100% by weight, specific gravity: 1.1). 인편상 안료 및 체질 안료의 평균 입자경, 평균 두께, 어스펙트비 및 굴절률, 경화제의 가드너 색수, 및 건조 도막 두께 T를 갖는 각 착색 도료의 건조 도막의 은폐율(각 착색 도료의 건조 도막 두께 T에서의 은폐율)은, 다음의 방법에 따라 측정했다. The average particle diameter of the scaly pigment and extender pigment, and the average thickness, the aspect ratio and the refractive index, Gardner number of colors of the curing agent, and the cover factor of the dry film for each colored coating having a dry film thickness T (in a dry film thickness of the colored pigment T the cover ratio) is measured by the following methods. 분체 화상 해석 장치(주식회사 세이신기업제의 「PITA-3」)를 이용하여 인편상 안료 또는 체질 안료의 입자 화상을 촬영하고, 얻어진 촬영 화상 중에서, 입자의 주면(主面)에 대해서 수직한 방향으로부터 촬영된 50개의 입자를 선택하고, 각각의 입자에 대하여 장경과 단경을 측정했다. Among the powder image analyzer (Co. Seishin Enterprise claim of "PITA-3 ') and scaly pigment or take a particle image of an extender pigment, and recording the obtained image by using the vertical direction with respect to the main surface of the particle (主 面) select from the photographed particles, and 50, the long diameter and short diameter were measured for each particle. 당해 50개의 입자의 장경의 평균값을 그 인편상 안료 또는 체질 안료의 평균 입자경으로 하고, 당해 50개의 입자의 단경의 평균값을 그 인편상 안료 또는 체질 안료의 평균 두께로 했다. The average value of the major axis of that 50 particles with an average particle size of the flaky pigment or extender pigment, and had a mean value of the minor diameter of such particles 50 to the average thickness of the scaly pigment or extender pigment. 또한, 평균 입자경을 평균 두께로 나누어, 어스펙트비를 산출했다. Further, by dividing the average particle diameter by the average thickness, the aspect ratio was calculated. 상기 분체 화상 해석 장치의 측정 조건은 다음과 같다. The measurement conditions of the powder image analyzer is as follows. JIS K 0062: 1992에 따라 인편상 안료 및 체질 안료의 굴절률을 측정했다. JIS K 0062: A scale to measure the refractive index of the pigment and extender pigments in accordance with the 1992. JIS K 5600-2-1: 2014에 따라 가드너 색수를 측정했다. Gardner was measured according to the number of colors 2014: JIS K 5600-2-1. 한편, 경화제 1의 가드너 색수는 휘발분을 감압 가열하에서 제거한 뒤에 측정했다. On the other hand, Gardner number of colors of the curing agent 1 was measured after removal of the volatile components under reduced pressure and heating. JIS K 5600-4-1: 1999에 따라, 막 두께가 건조 도막 두께의 설정값 T인 각 착색 도료의 건조 도막의 은폐율을 측정했다. JIS K 5600-4-1: 1999 in accordance with, the film was measured in the cover rate of the dry film for each colored coating having a thickness of the set value T of the dry film thickness. 900mm×900mm의 이지(梨地, pear skin) 강판에, 숍프라이머(닛폰페인트마린(주)제의 「닛페세라모 그레이」 또는 「닛페세라모 브라운」)를 건조 막 두께가 15μm가 되도록 도공하고, 상온에서 24시간 이상 건조시켜 시험판을 제작했다. Of 900mm × 900mm not (梨 地, pear skin) is a steel sheet, the shop primer (manufactured by Nippon Paint Marine Ltd. The "nitpe sera all gray" or "nitpe sera all brown 'of) the dry film thickness and coating to be 15μm, by more than 24 hours drying at room temperature to prepare a trial. 한편, 표 3∼표 5에 있어서, 「닛페세라모 그레이」 및 「닛페세라모 브라운」은 각각 「회색」 및 「브라운」으로 생략해서 기재되어 있다. In the other hand, Table 3 to Table 5, "nitpe sera all gray" and "parent nitpe Sera Brown" is described to omit the "gray" and "brown" respectively. 다음으로, 얻어진 시험판의 숍프라이머 표면에, 에어리스 스프레이법에 의해, 위에서 조제하고 주제 및 경화제의 2액을 혼합한 표 3∼표 5에 나타내는 착색 도료를 도공하고, 24시간 실온에서 건조시켜 방식 도막을 형성했다. Next, the shop primer the surface of the obtained test plate, by airless spraying, by preparing and coating a colored coating shown in the Table 3 to Table 5, a mixture of two fluid of the subject and a curing agent, dried for 24 hours at room temperature on the anticorrosive coating film the it formed. 이때, 각 실시예 및 비교예의 각각에 있어서, 표 3∼표 5에 나타내는 건조 막 두께를 갖는 복수의 건조 방식 도막을 형성했다. At this time, in each of Examples and Comparative Examples, respectively, to form a plurality of drying anticorrosive coating film having a dry thickness shown in Table 3 to Table 5. 각 도막의 건조 막 두께는 케트(주)제의 전자식 막 두께계 「COATING THICKNESS TESTER LE-900」을 이용하여 측정했다. Dry film thickness of each coating was measured using the blankets (Co., Ltd.) of the electromagnetic film thickness meter, "COATING THICKNESS TESTER LE-900." JIS K 5600-4-5: 1999에 준거한, 스가시험기(주)제의 삼자극치 색채계 SM 칼라 컴퓨터 「SM-7CH」에 의한 측정 및 JIS K 5600-4-6: 1999에 준거한 계산에 의해, 얻어진 각 건조 막 두께를 갖는 방식 도막과, 각 착색 도료가 목표로 하고 있는 건조 도막 두께의 설정값 T의 색차 ΔE를 구했다. For conforming to the 1999 calculation: JIS K 5600-4-5: 1999 conforming to, Suga Testing Machine Co., tristimulus values ​​colorimeter SM color computer measurement by the "SM-7CH" of JIS K 5600-4-6 and the by this, it was determined for each method having a dried thickness of the coating film, and a color difference ΔE of the set value T of each of the colored coating dry film thickness that is obtained as a target. 결과를 표 3∼표 5에 나타낸다. The results are shown in Table 3 to Table 5. 또한, 각 건조 막 두께를 나타내는 방식 도막의 웨트 도막 상태에서의 하지 은폐성(방식 도막에 의한 숍프라이머 도막의 은폐성)을 육안으로 관찰하고, 하기 판정 기준에 기초하여 평가했다. In addition, the observed no-hiding coating layer in the wet state (hiding of the shop primer coating film according to the anticorrosive coating film properties) of each coating film drying method indicates a film thickness with the naked eye and evaluated based on the following criteria. 결과를 아울러 표 3∼표 5에 나타낸다. 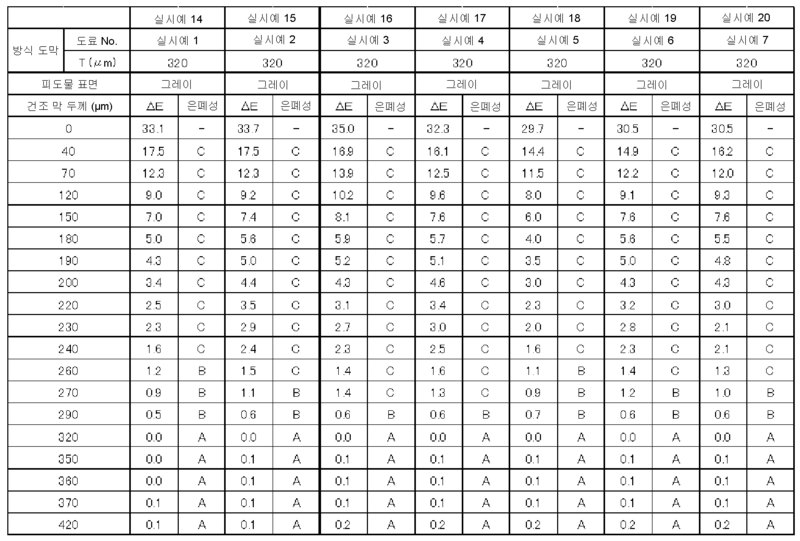 In addition, the results shown in Table 3 to Table 5. 각 실시예 및 비교예에 대하여, 표 3∼5에 나타내는 건조 막 두께(μm)를 가로축으로 하고, 표 3∼5에 나타내는 ΔE를 세로축으로 한 그래프를 도 1∼도 8에 나타낸다. For each of Examples and Comparative Examples, the horizontal axis represents the dry film thickness (μm) shown in Table 3-5, and Figure a graph of ΔE shown in Table 1 to 3 to 5 with the vertical axis shown in FIG. 한편, 표 3∼표 5에 있어서의 건조 막 두께 0μm에서의 ΔE는, 건조 막 두께가 T인 방식 도막과 피도물 표면(숍프라이머 도막 표면)의 색차를 의미하고 있고, 전술의 색차 ΔE3과 동의이다. On the other hand, ΔE in the dry film thickness of 0μm in Table 3 to Table 5, and means a color difference of a dried thickness of the anticorrosive coating film and pidomul surface (shop primer coating film surface) T, a color-difference agree with the above-described ΔE3 . 를 추가로 만족시키는 방법. How to Add to meet. 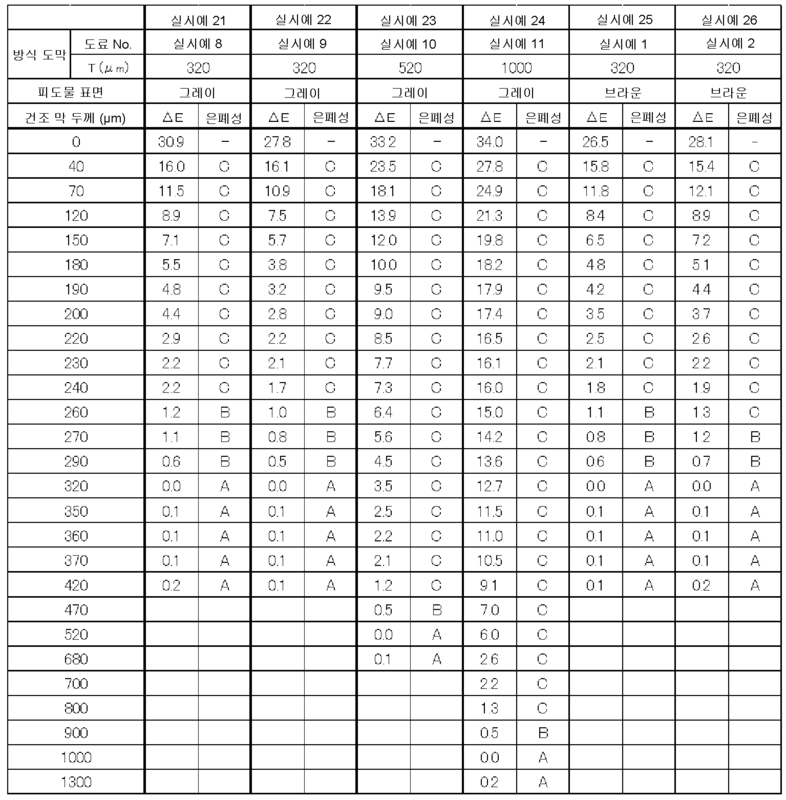 상기 건조 도막 두께 T를 갖는 상기 착색 도료로 형성되는 도막은 은폐율이 0.90∼0.98인 방법. Coating method of hiding ratio is 0.90 to 0.98 is formed from the colored coating material having a dry film thickness T.
상기 착색 도료는 경화제를 추가로 함유하는 방법. Wherein the colored pigment is a way to further contain a curing agent. 상기 경화제는 가드너 색수가 18 이하인 방법. The curing agent is not greater than the number of Gardner color 18. 상기 착색 안료의 함유량이, 도막 형성 성분 중, 0.01∼3용량%인 방법. Of the content of the coloring pigment, the coating film-forming component, 0.01 to 3% by volume methods. 상기 인편상 안료가 탈크, 마이카 및 글라스 플레이크로 이루어지는 군으로부터 선택되는 적어도 1종의 안료인 방법. The method of the flaky pigment is at least one kind of pigment selected from the group consisting of talc, mica and glass flake. 상기 착색 안료가 이산화 타이타늄을 포함하는 방법. Wherein the colored pigment comprises titanium dioxide. 상기 피도물의 표면은 강제이거나 또는 상기 피도물이 갖는 하도층의 표면인 방법. Surface of the pidomul is forced or or method of undercoating the surface of the layer having the above pidomul. 를 추가로 만족시키는 착색 도료. Colored coating that satisfies further. 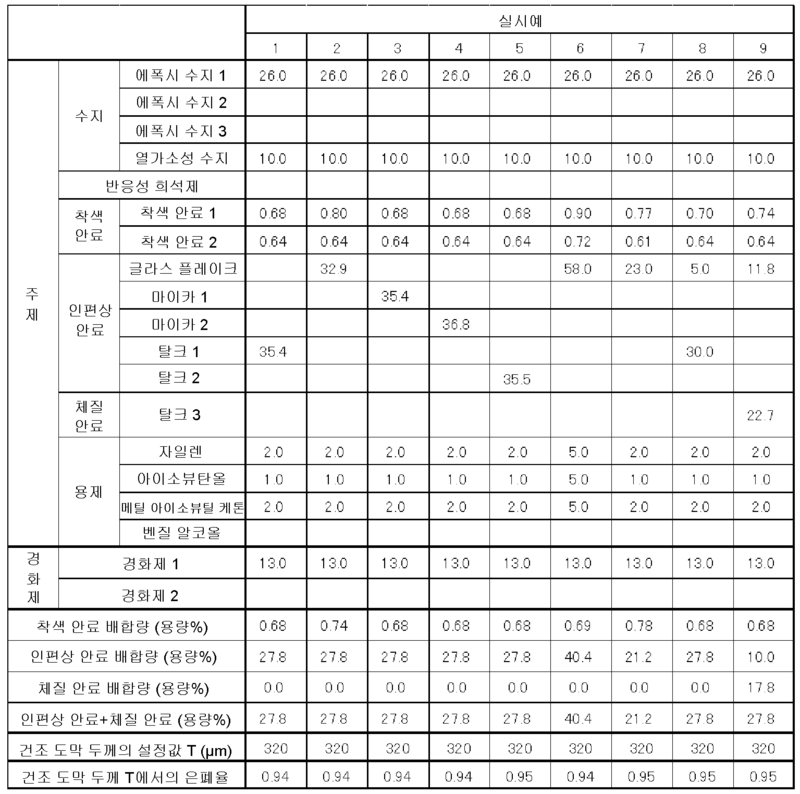 상기 건조 도막 두께 T를 갖는 상기 착색 도료로 형성되는 도막은 은폐율이 0.90∼0.98인 착색 도료. A colored coating film formed with the colored coating having a dry film thickness T is hiding ratio is 0.90 to 0.98. 경화제를 추가로 함유하는 착색 도료. Colored paint further contains a curing agent. 상기 경화제는 가드너 색수가 18 이하인 착색 도료. The curing agent is color Gardner number of 18 or less colored pigment. 상기 착색 안료의 함유량이, 도막 형성 성분 중, 0.01∼3용량%인 착색 도료. The colored pigment content of the colored pigment, of the coating film-forming component, 0.01 to 3% by volume. 상기 인편상 안료가 탈크, 마이카 및 글라스 플레이크로 이루어지는 군으로부터 선택되는 적어도 1종의 안료인 착색 도료. A colored coating the flaky pigment is at least one kind of pigment selected from the group consisting of talc, mica and glass flake. 상기 착색 안료가 이산화 타이타늄을 포함하는 착색 도료. Colored pigment to the colored pigment comprises titanium dioxide. DE69202487T2 (en) * 1991-01-30 1996-02-29 Dainippon Toryo Kk Growth retardant underwater paint.